New additions of very fine 1d blacks from various plates. 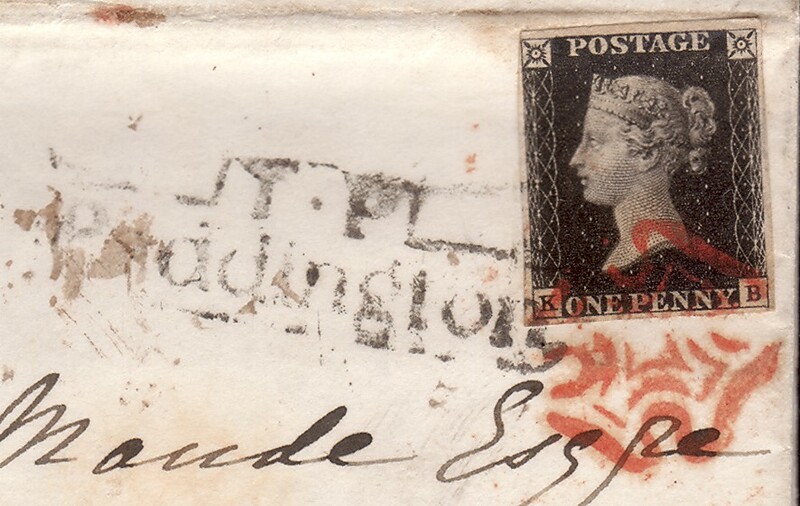 one with Inverted Watermark and one of the EKD for a Leamington Cross. There is a superb Plate 10 with a RED cross and varieties. 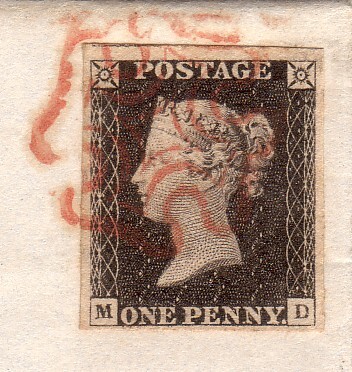 fine 4-margined example, slightly ragged margin near 'L' square, with part of the stamp below. Cancelled by a complete MANCHESTER FISHTAIL CROSS, SG Spec AS15ub. Rare to find this as a complete cross on a 4-margined 1d black. 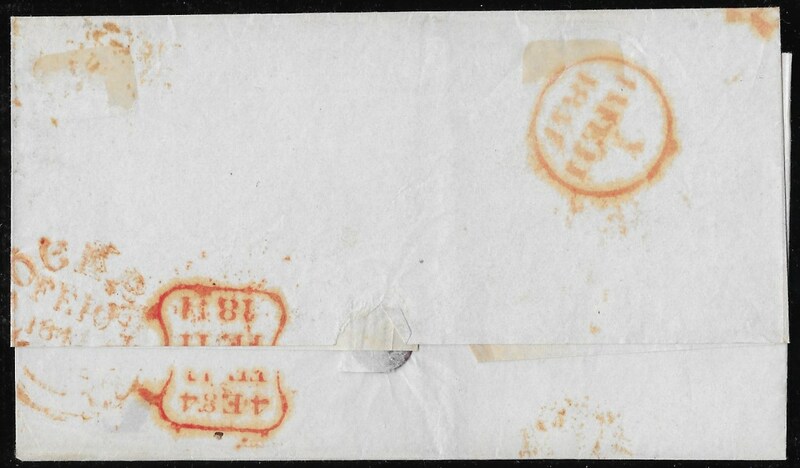 Plate 2 is much scarcer with any black cross, SG AS15m: almost TWICE the Gibbons price. is priced at £1,400 without the premium of being on Plate 2. NB: the scan does not do justice to the cross. 152201. 1d Plate 4, 'PI': almost full-margins, large on three sides and just shaving the NW corner. 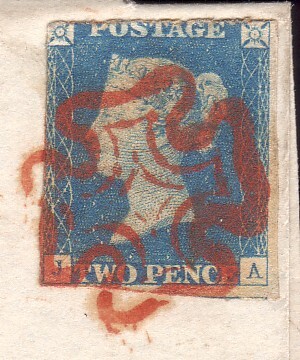 Along the top margin is a trace of the stamp above. Tied to a small piece by a double strike, Contrary to PO Regulations, of the distinctive Manchester Fishtail Cross. 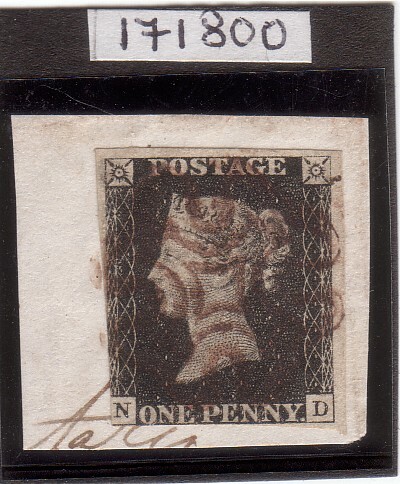 This characteristic Manchester cross, in the latest, 2011 QV Volume 1 Catalogue, is priced at £1,400: Spec AS23ub. The browning in the right hand margin is much fainter than in the scan and similarly in the cross at the left. The brown in the top margin is a trick of the scanner: the scan does not do justice to this item. Unusual to find a double strike of this cross. 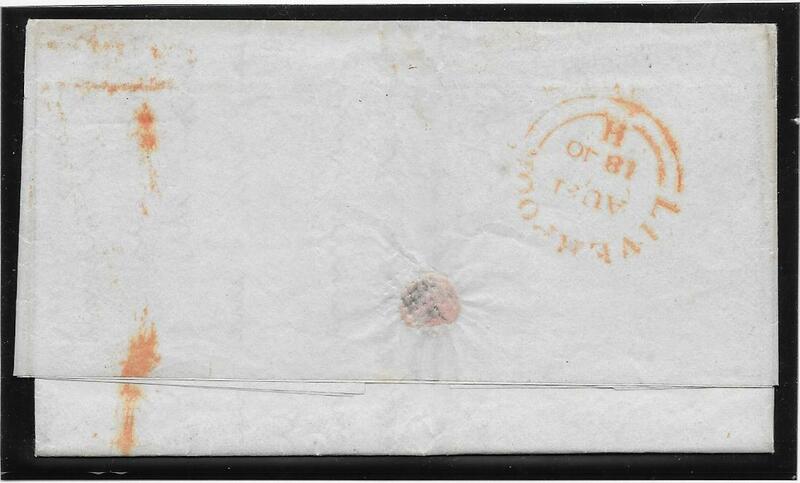 Scroll down to Item 151439: Plate 4 on a wrapper with this Cross. 152153. a). 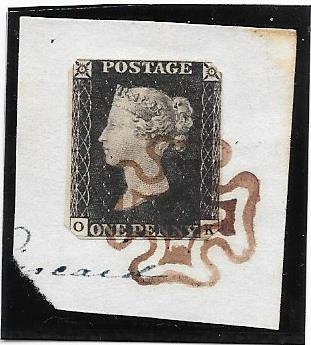 1d black plate 9, 'QJ', very close 'J' square, touched at left, other clear margins: on a wrapper from LOCKERBIE to London. 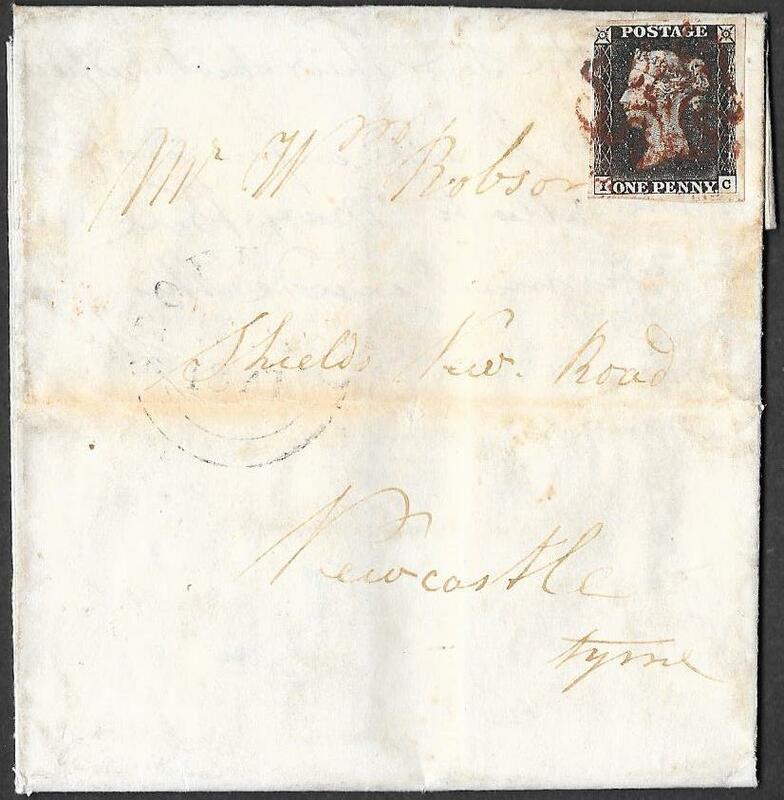 Tied by a RED cross and on the reverse a Lockerbie date stamp in the same red ink for February 10th 1841: London receivers for February 11th 1841. 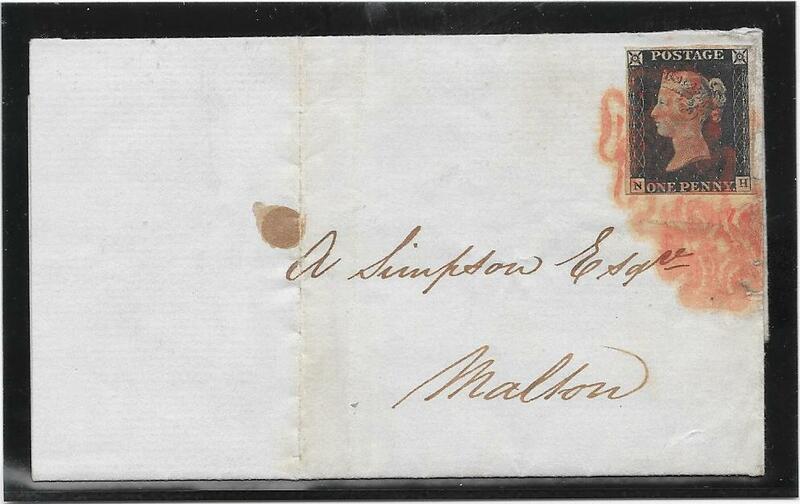 On February 10th 1841, black ink replaced red ink for the Maltese cross cancellations across Great Britain. The Lockerbie postmaster/mistress did not comply with, or had not yet received, the new Post Office Regulation to use black ink. This may well be the last day that red ink was used in Lockerbie to cancel a stamp. There is a light horizontal fold in the paper near the top which does not affect the 1d black. used from LONDON to Ludlow and tied by a fine/very fine upright BLACK cross. 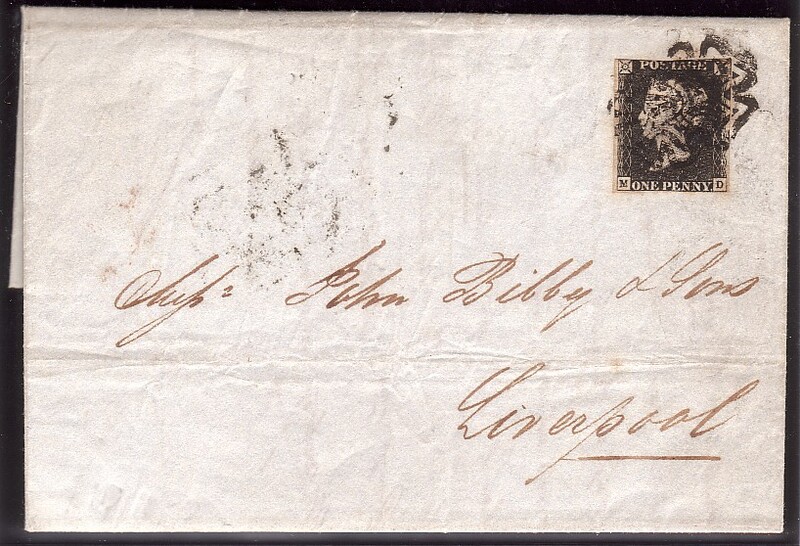 The letter is dated February 10th 1841 and on the reverse is a London date stamp also for February 10th 1841. This was the FIRST DAY of official usage of the BLACK cross. the 1d black and the1d red (latter issued on this same date), was changed officially from RED to BLACK. The pair would make a fine and memorable display item. prices the First Day of official use of the Black Cross on cover at £4,000. the MXs leave the 'O' flaws clearly visible. 152088. Two entires from STOKESLEY, North Yorkshire both to Newcastle. 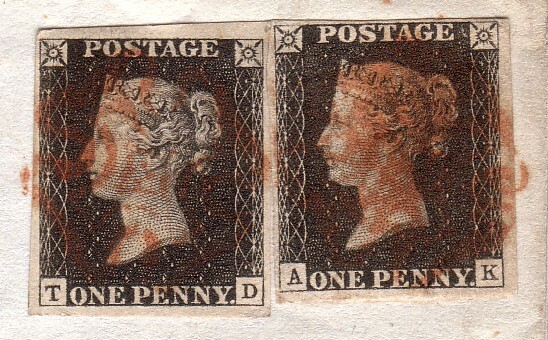 The first has a 1d black plate 1b, 'IC', generous margins all round but shaved at the right side of the NW corner square and tied by a red-brown cross. 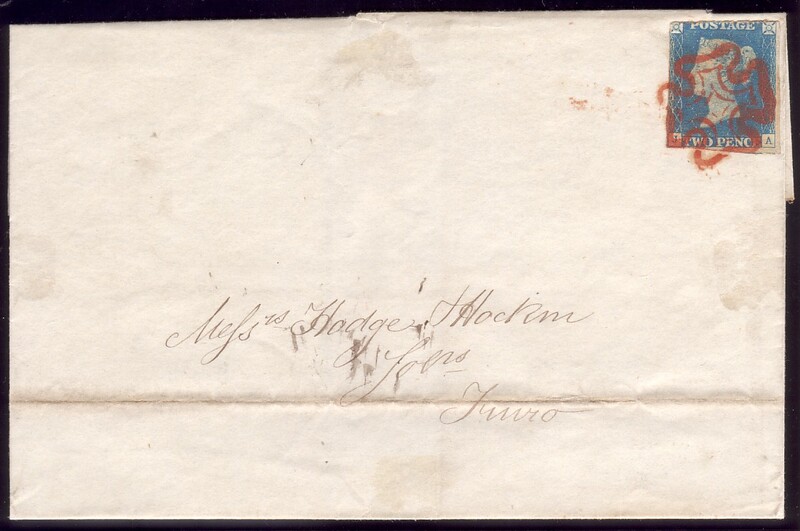 The family letter is dated inside January 21st 1841 and no postal markings on reverse. The second has a fine 4-margined, close but clear at the bottom, 1d red, 'BG', clearly showing the triple break in the NE square and is from Plate 22. 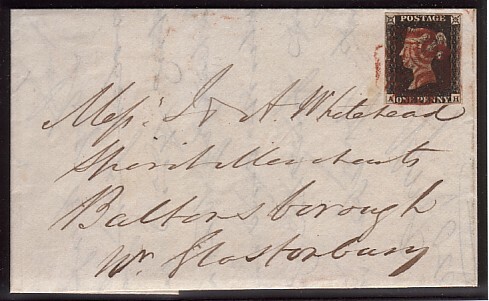 The stamp is tied by a BLUE Stokesley cross with a partial strike of the Stokesley cds on the reverse for November 1841 and in the same blue ink as the cross. From Danzig's listings, this cross in blue is rare with only the Leeds and York characteristic crosses in blue given a rarer grading for a Yorkshire blue cross. without adding a premium for the rarity of the example offered here. A superb Exhibition pair of items. NB: Stokesley was, and still is, a rural community which in 1841 had a population with the surroundings of only 2,300. One wonders how few of these could read and write? The front of the 1d black entire is in a finer condition than the scanned image. 152084. 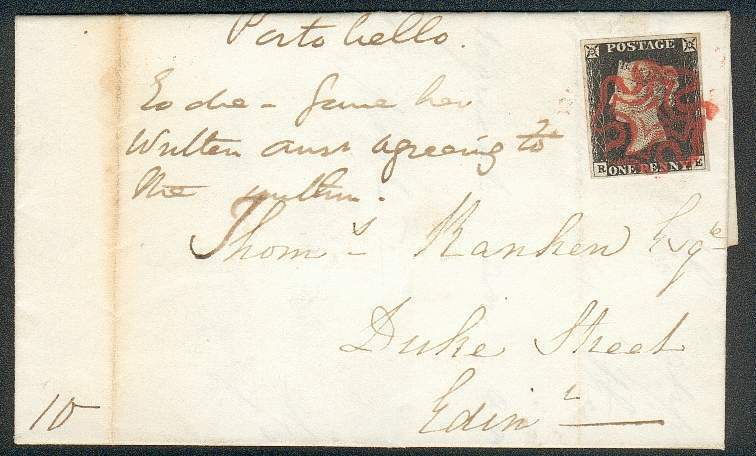 1d black plate 5, 'LE', very fine 4-margined example tied to a clean and neat entire from BRISTOL to London by a Bristol cross in VERMILION ink. 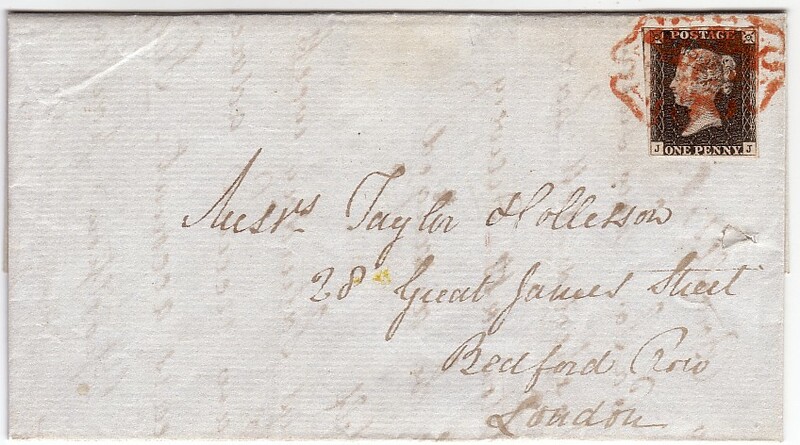 On the reverse top flap is a Bristol date stamp for November 9th 1840 and an indistinct large undated circle. 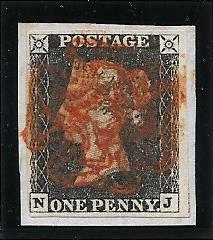 This vermilion cross is listed by Gibbons as Spec AS25vh and priced at £3,000 in the latest, 2011, QV Volume 1. 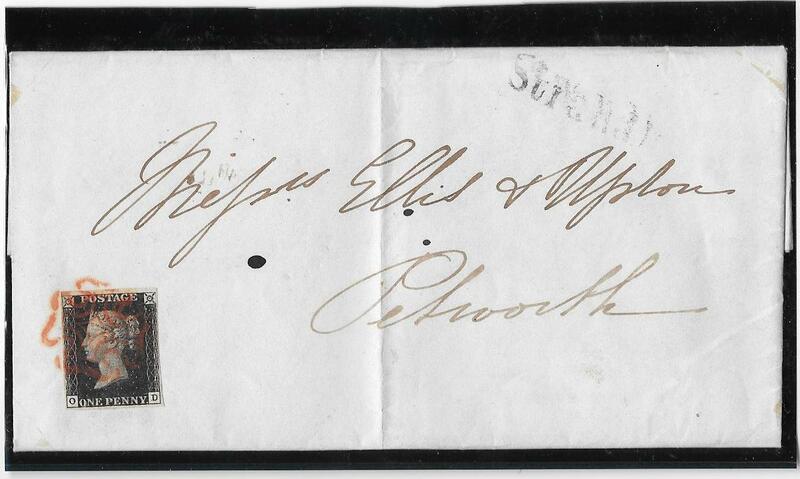 The letter is from Bristol College and dated November 8th 1840 - a Sunday. A superb Exhibition item with a clean BPA Certificate. NB: the scans do not do justice to the vermilion shade. 152085. 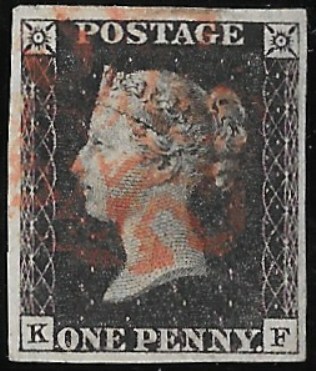 1d black plate 5, 'FK', 3 plus margins and a small rub at the bottom of the SE 'K' square. an Edinburgh cds for May 22nd and a Leith date stamp for this same date and all display well when the flap is raised. 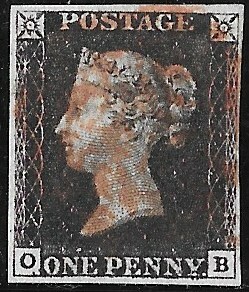 priced by Gibbons in the latest, 2011 QV Volume 1, at £9,000. Jackson and Rockoff, (Volume 2), record ONLY three examples of this cross on a 1d black on cover. The example offered here is one of the three and the LATEST recorded on a 1d black. possibly caused by the reader holding it too close to a lamp or candle! 152045. 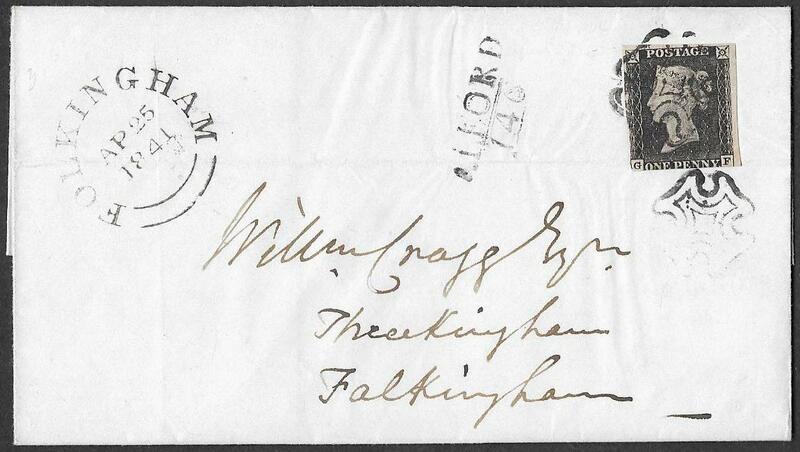 1d Plate 8, 'JG', 3-margined with parts of two other 1d blacks: tied to an entire from LEAMINGTON to Henley in Arden. Letter opened at the top and stuck down at the sides with the top flap carefully removed leaving the wax seal almost totally intact. 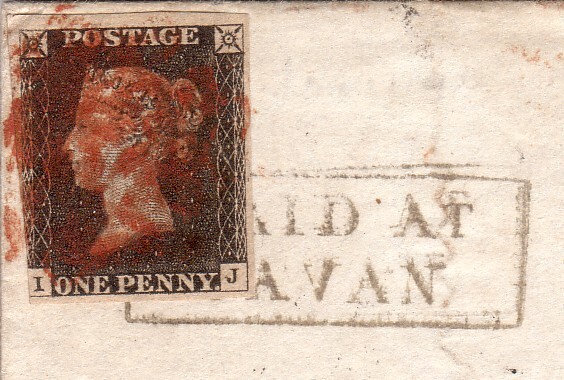 and a partial strike on the reverse of a Straford on Avon date stamp for the following day. Also on the front is a very fine strike of the Upper Parade Leamington, County Cat. WA212 in orange-red. This is recorded from 1841-51 and therefore the example here is one of the, if not the, earliest known. 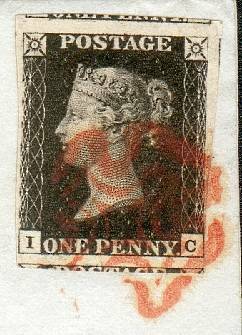 The Leamington cross is unrecorded by Gibbons on the 1d black but is listed as SpecB1tk on the 1d red on cover at £800. 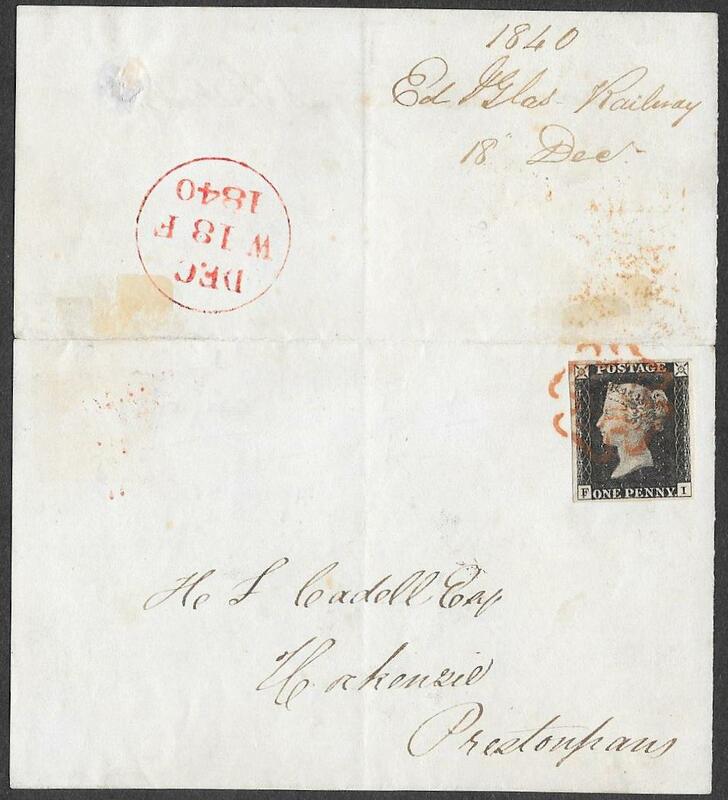 Plate 8 on cover with an ordinary cross is priced by Gibbons at £1,000 before allowing for the Leamington Cross. 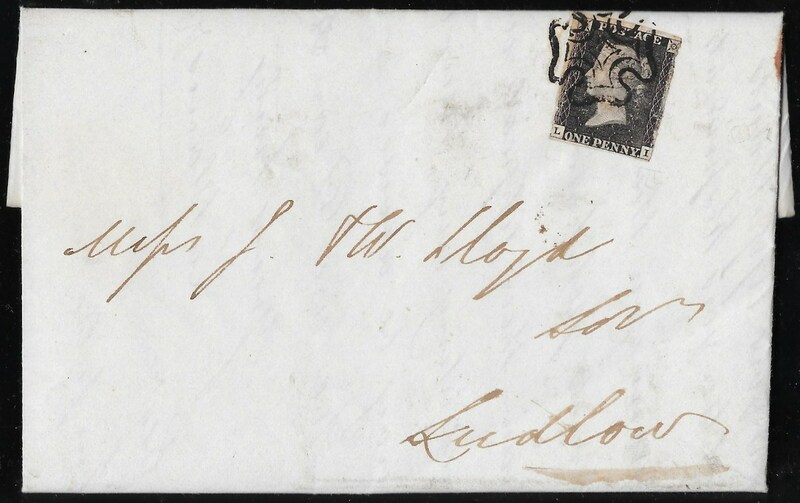 Rockoff records the EKD on a 1d black for the characteristic cross as March 15th 1841. 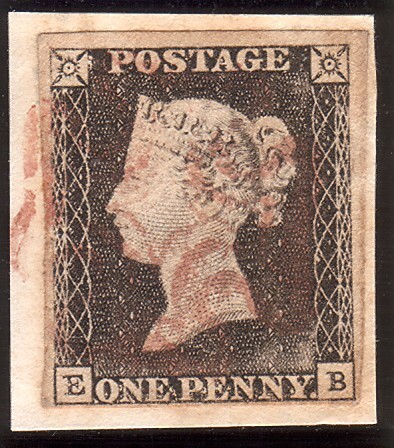 The example offered here at March 24th 1841, matches the second earliest such usage on a 1d black. A very scarce and attractive item. NB: The earliest recorded usage by Rockoff of the Upper Parade Leamington strike is on a 1d Mulready for April 20th 1841.
virtually full margined, close but clear at right and very close to barely touching top NW corner square. The partially open NW top frame line is visible on the Nissan plating images; the cross leaves the 'O' flaw neatly visible. 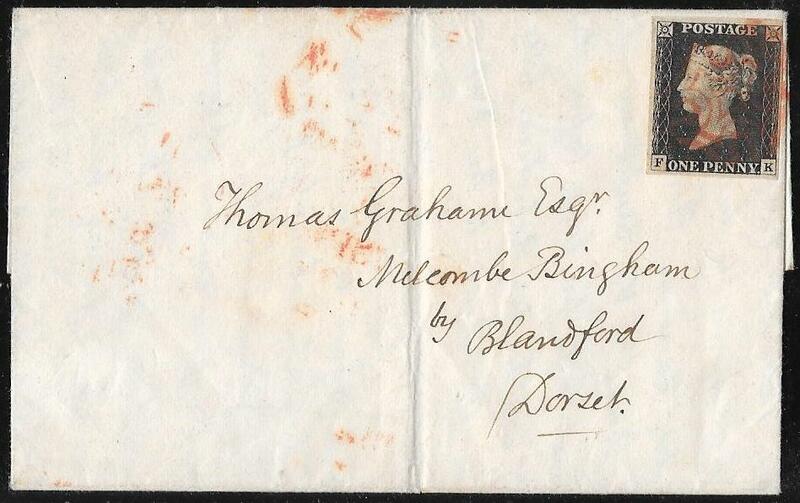 Sent to Thornbury, Gloucestershire with a ROSS (Herefordshire), date stamp on reverse for March 11th 1841. The Ross date stamp is County Cat. HF386, recorded in red only in 1841 and unpriced in the County Catalogue. The letter 'I' is a distinctive one characteristic of this plate. and with the 'O' flaw again neatly clear of the superb cross and the letters. Gibbons prices the 1d black Plate 10 on cover at £3,500. A very rare and attractive pair of items. 151852. 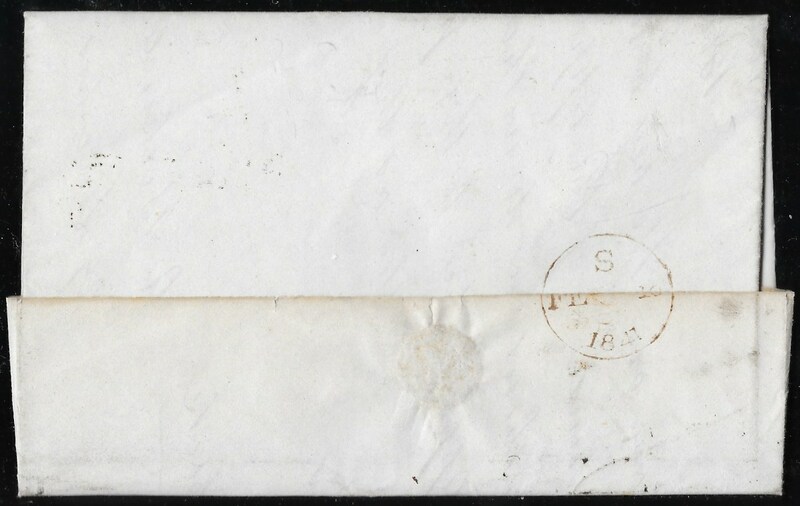 1d black Plate 7, 'GF', 3-margins, into at the bottom and this area crossed by a horizontal filing fold. Wrapper with ALFORD/140 mileage strike. Rockoff and Jackson, Volume 2 p 250 note that Alford was a sub office of Spilsby. 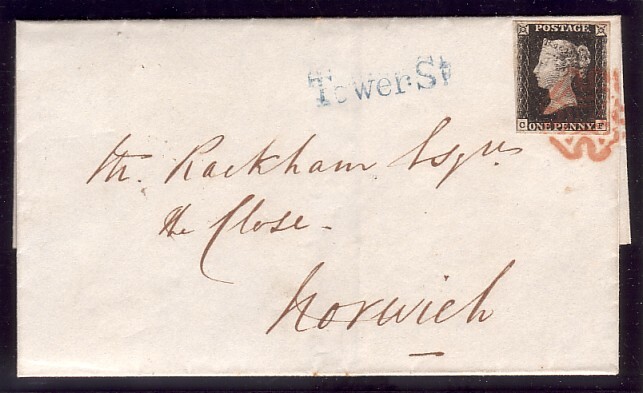 Inside is a date for April 24th and the item was received in Folkingham on SUNDAY April 25th 1841. 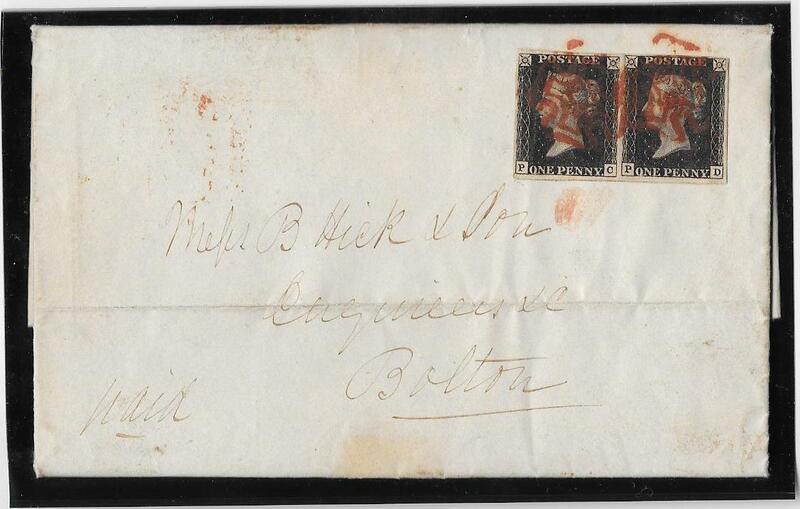 In there listed examples of the extra cross, only one has a full date, on a 1d red cover, 21st September 1841. They note that Danzig mentions 1d red examples from Alford for April and November 1841 but no precise date is quoted. 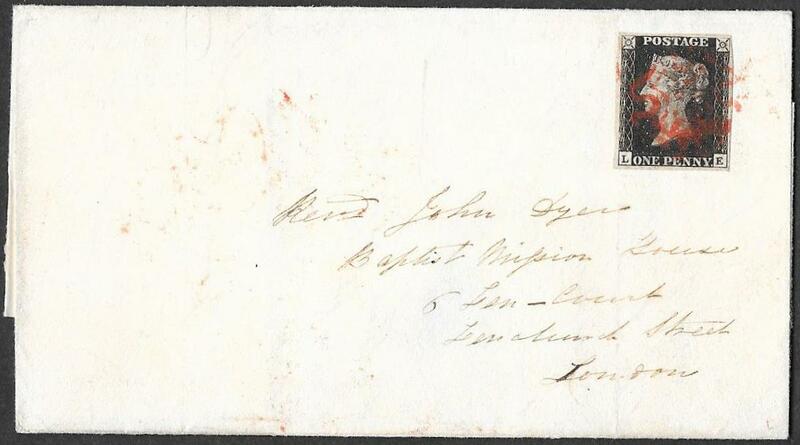 At April 24th 1841, it is later than the latest example on a 1d black cover listed by Rockoff and Jackson. This example from Alford is the only one with a mileage mark - the other example has a udc. 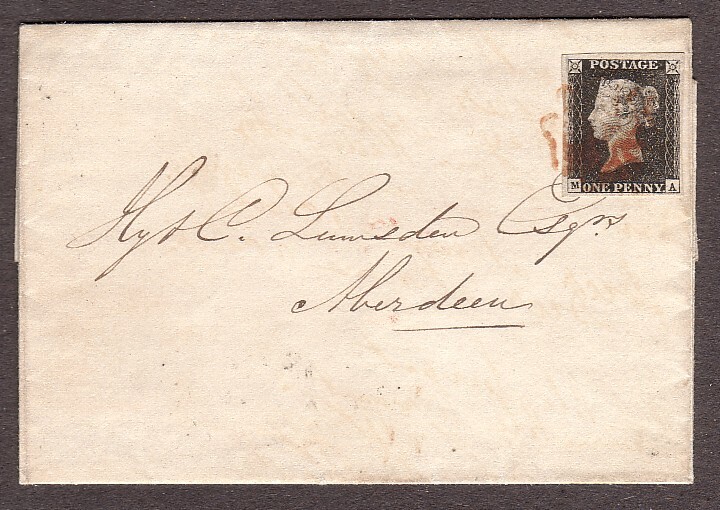 A rare and attractive example with all the postal markings on the front. NB: the population of Splisby in 1841 was only 1,457 souls. See Item 151853 in the Line engraved Section for a 1d red on cover with this same Cross. Plate 1b INVERTED Watermark and other varieties. 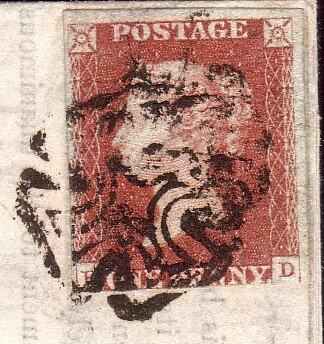 close but clear under 'H' square, neat red cross, with a very small natural paper inclusion. 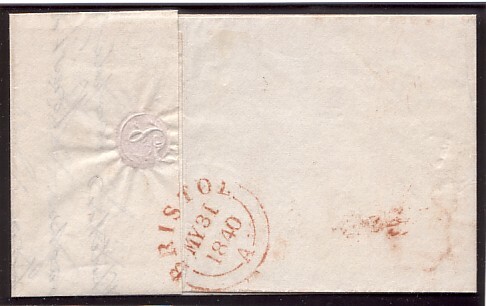 on THIN paper and with INVERTED Watermark, SG Spec AS14(l,m). The thin paper allows the MX to be visible as well as some of the black ink from the printing itself. This plate with inverted watermark and in the ordinary black shade is priced by Gibbons at £2,500. the Gibbons price rises to in excess of £5,000. A very rare combination of features and one we have not previously seen. 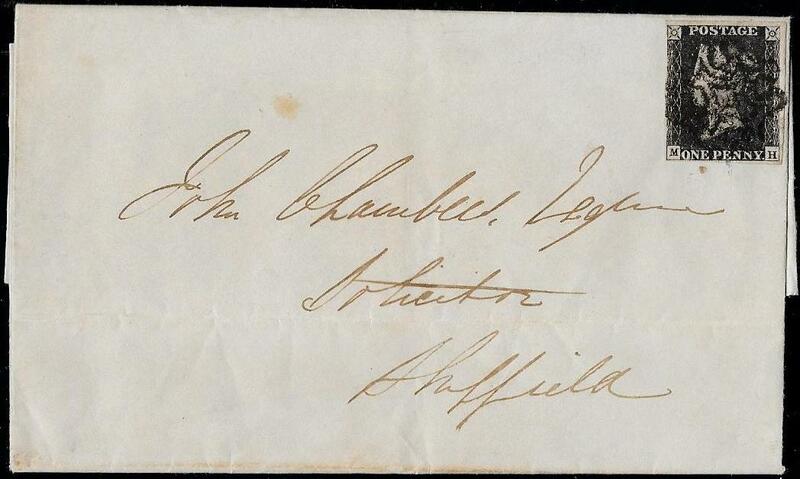 very fine 4-margined on a clean commercial entire from LEEDS to Sheffield, July 23rd 1841. SG Spec AS66ua, leaving the 'O' flaw visible. 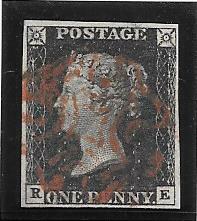 We can find no record of this cross on a 1d black Plate 10 on cover. on a 1d black on cover at £10,000. A Gibbon's Estimated Price for this cross, on Plate 10 is well, in excess of £20,000. An extremely rare and superb item. NB: the scans do not do justice to the quality of the Cross or to the fine condition of the entire..
151672. 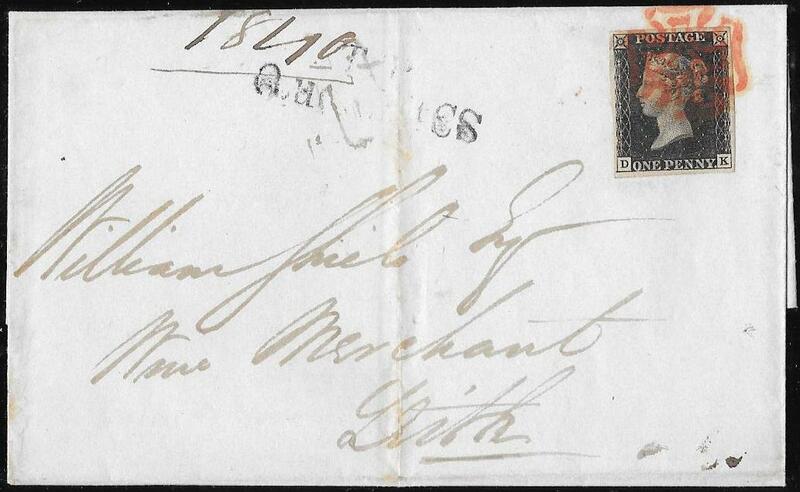 A small envelope from ROTHERHAM to LEWES, Sussex, September 5th 1840 with a 1d black, 'BK', Plate 1b, Spec AS5. the NE letter square as illustrated by Nissan for this plate and tied by a fine orange-red cross. 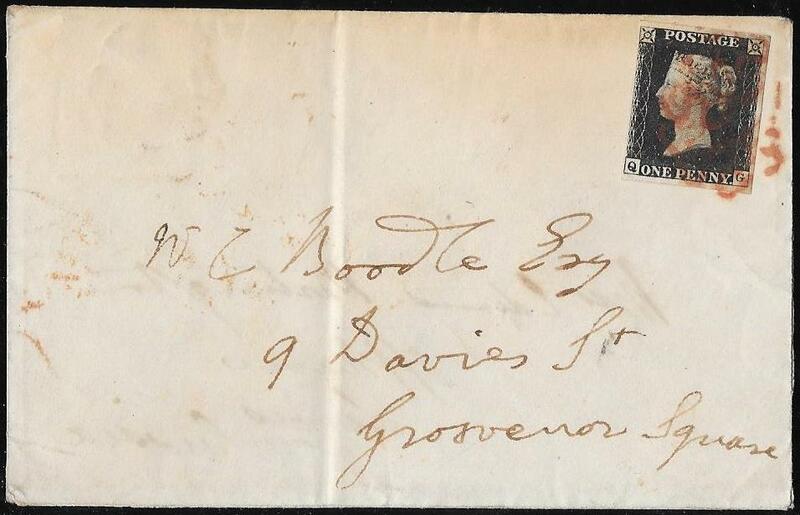 and on the reverse a Lewes date stamp for September 10th 1840 and a London receiver for the following day. 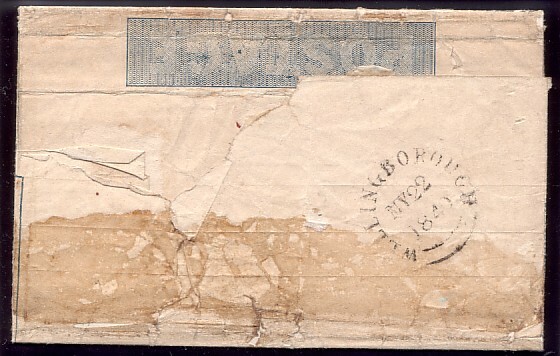 Also on the reverse side is a partial offset of another Maltese cross. Two 1d blacks used on turned covers is a very rare occurence. From our researches, we have located only three other examples since 2001. 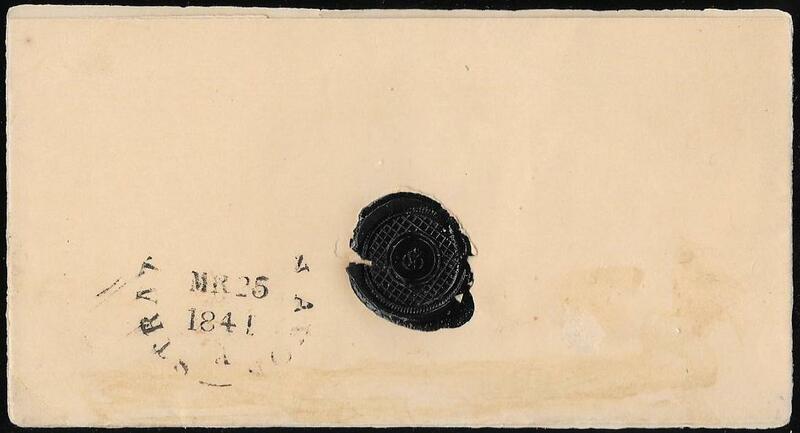 In 2001: an entire used within Scotland on March 26/28 1841, smudged black crosses and one 1d black creased. 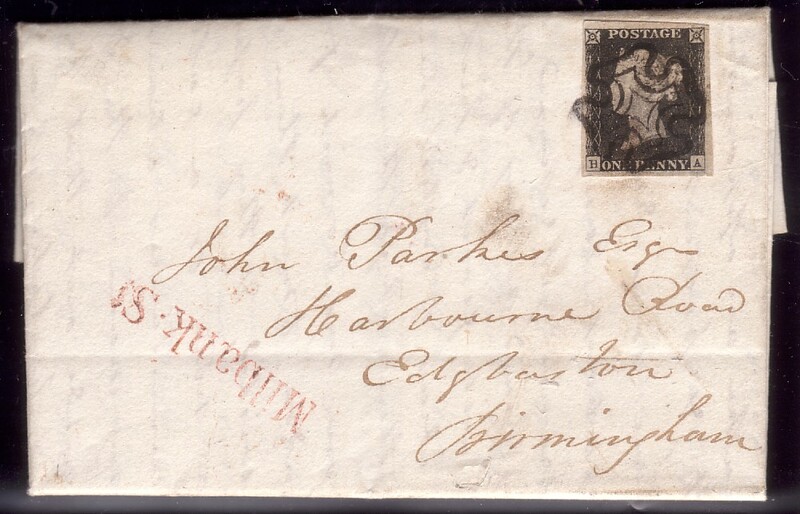 In 2002: an entire letter from Eastbourne to London, April 7th 1841, then turned and sent within London. One 1d black cut into, not tied, and with a poor and unclear black cross. 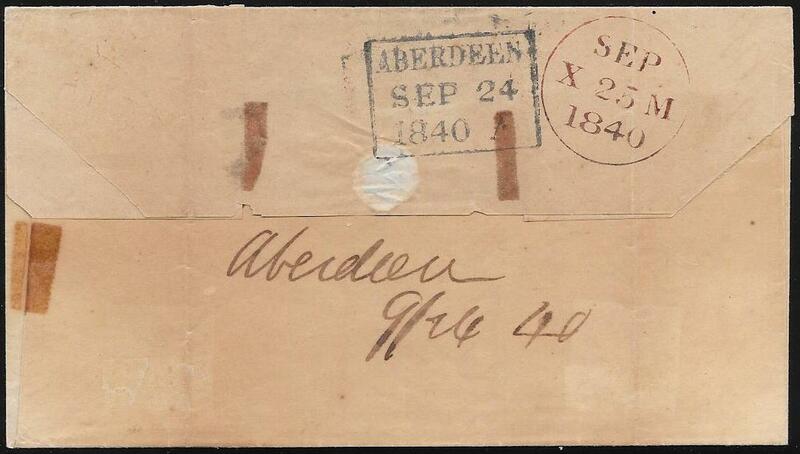 In 2008: an entire letter used within Scotland, sent originally on August 29th 1840. 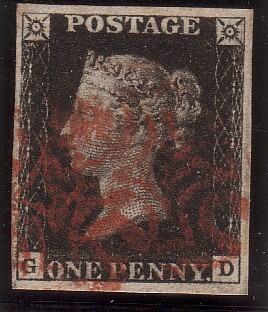 One 1d black touched along the top and crossed by a pressed crease. Both 1d blacks are cancelled by a red/orange cross which may tie the other 1d black. This 2008 example was sold by a London Auction House for an inclusive figure of almost £4,000. 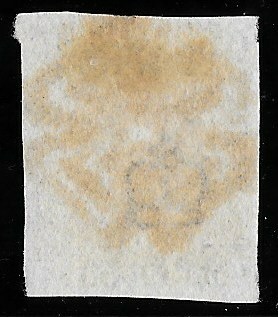 of a refolded envelope used with a 1d black in both directions. A superb item of considerable rarity and Exhibition importance. NB: a couple of the envelope folds have been strengthened with hinges. 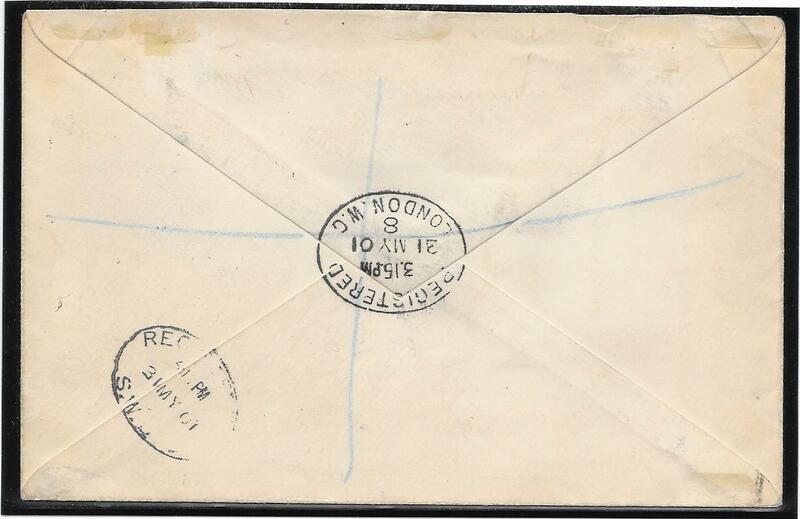 The condition of the envelope is finer and cleaner than the scans suggest. the scarcer Intense Black shade (from early printings), tied to a small, clean and un-creased entire by a fine BRISTOL CROSS. 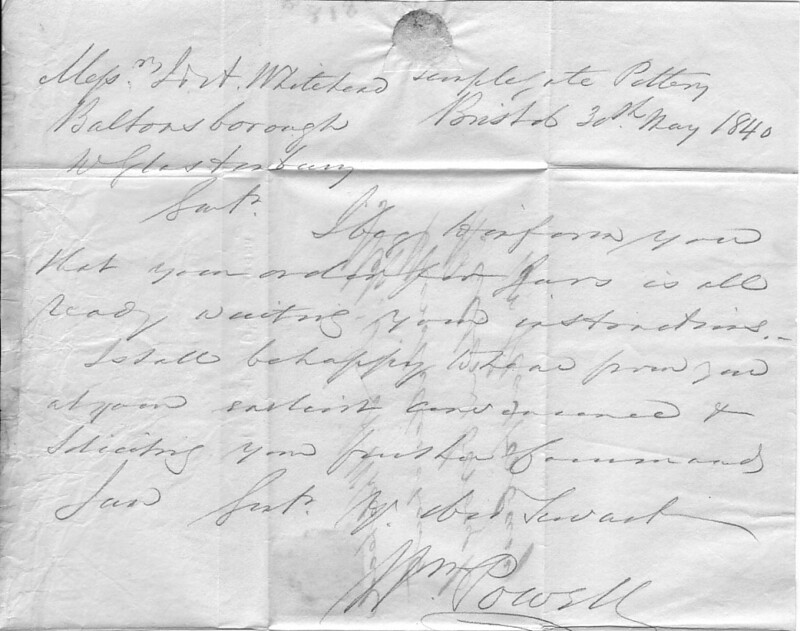 A handwritten and signed letter from the Temple Gate Pottery by the then owner William Powell. SUNDAY MAY 31st 1840 in the same shade of ink as the MX. 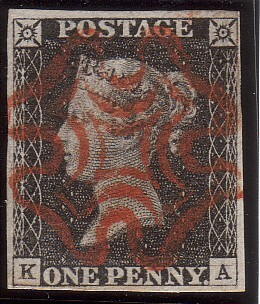 latest QV Volume 1, 2011 Edition, Spec AS19A(tk), at £13,000. The example offered here is from the scarcer plate 3: the earliest known date of usage for Plate 3 is May 16th 1840. We cannot recall previously seeing plate 3 used on any Sunday in May 1840.
last offered for sale almost 30 years ago. Temple Gate Pottery Bristol,Temple Gate, Temple parish. 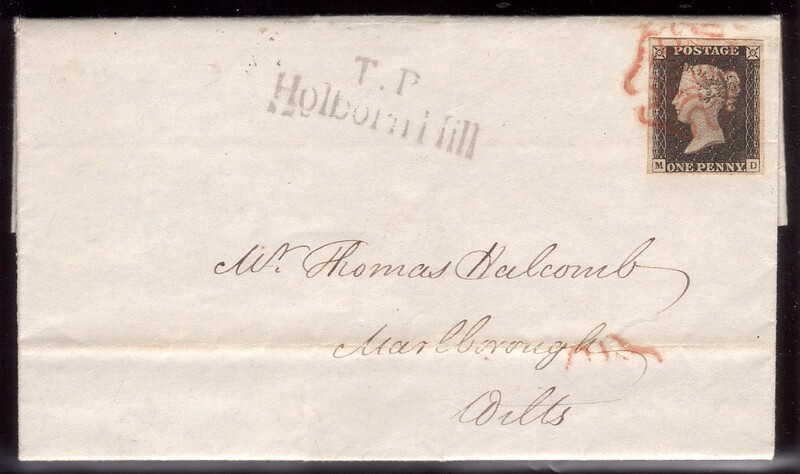 1820-1830 William & Thomas Powell (moved from the St Thomas Street Pottery). 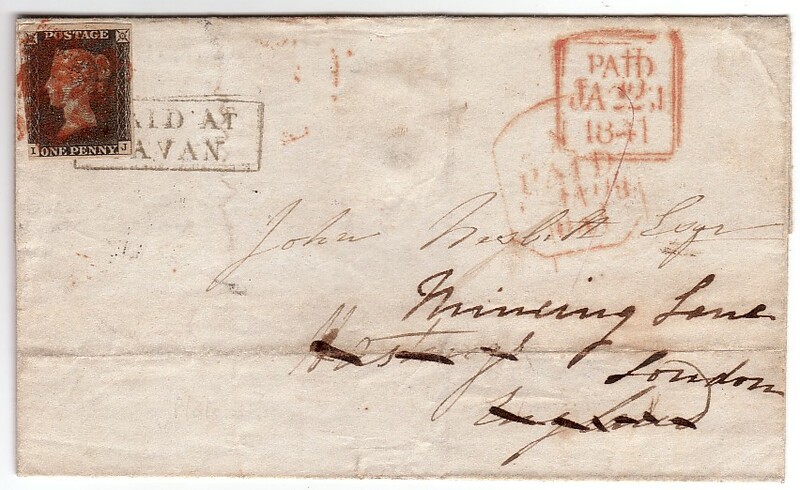 1831-1832 William & John Powell. 1833-1855 William Powell (he died in 1854). 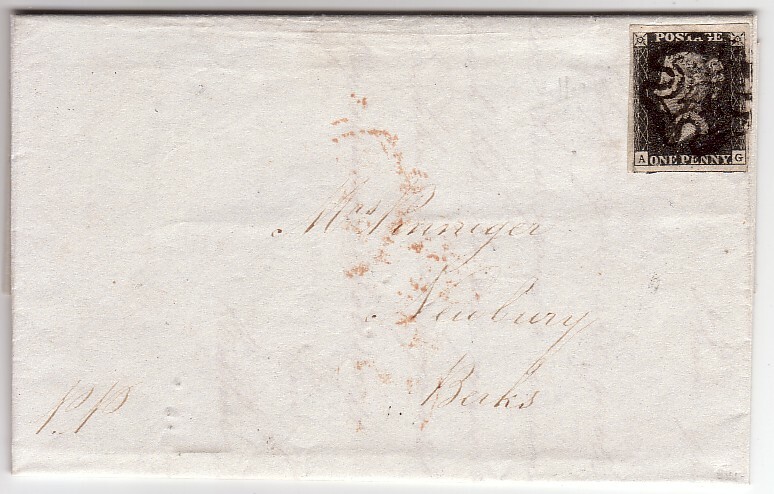 September 24th 1840 with the top flap reinforced along the top fold. as when viewed in oblique light there is no surface disturbance. 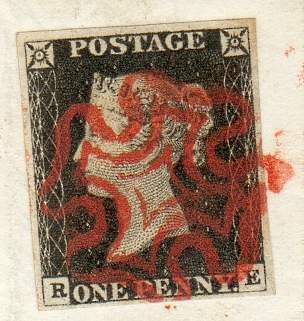 Stamp tied by a very fine Aberdeen cross in the distinctive RUBY ink, SG Spec A1ve. This colour of cross is priced by Gibbons on cover in their latest, 2011, QV Volume 1, at £4,500. 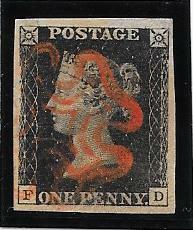 Letter 'E' is a listed double letter, SpecAS4d, and the stamp is in the scarcer intense black from early printings. Allowing for the Ruby cross on the scarcer intense black, a Gibbons price is in excess of £6,000. 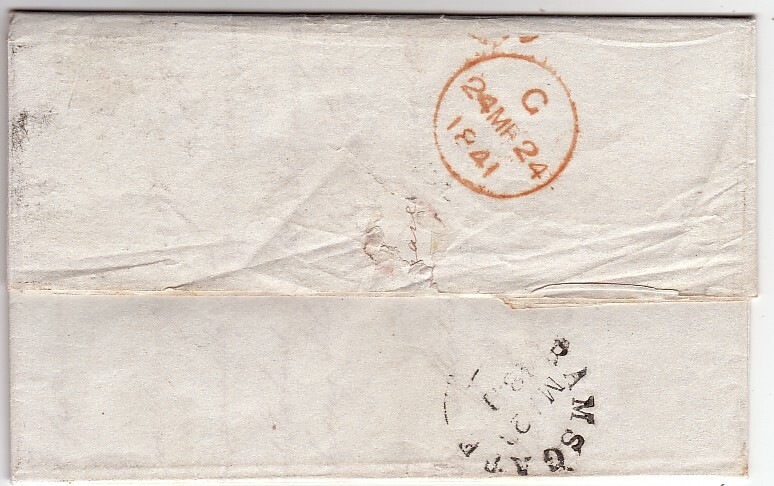 A rare example of this coloured cross on cover. Plate 2: superb WATERY CROSS. 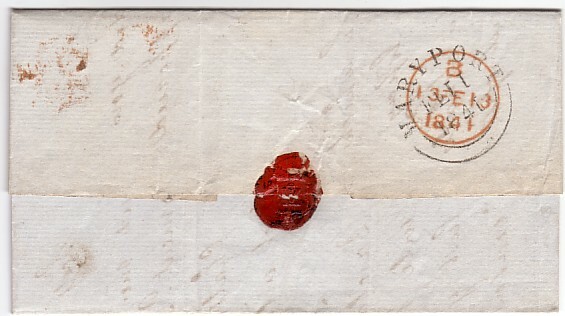 tied to a small piece by a Watery Cross the stamp with clipped corners. Watery crosses are discussed in Rockoff Volume 1, page 116. No water was added to the ink but an oil such as linseed. The three criteria for a cross to be correctly described as watery are set out in Rockoff page 116. The example here fulfills all of the three criteria and it could be a Glasgow watery cross. A superb example neatly struck and leaving a large portion of QV’s Head clear. A black cross on plate 2 is scarcer than a red cross, SG Spec AS15m. The finest example of a watery cross we have seen. 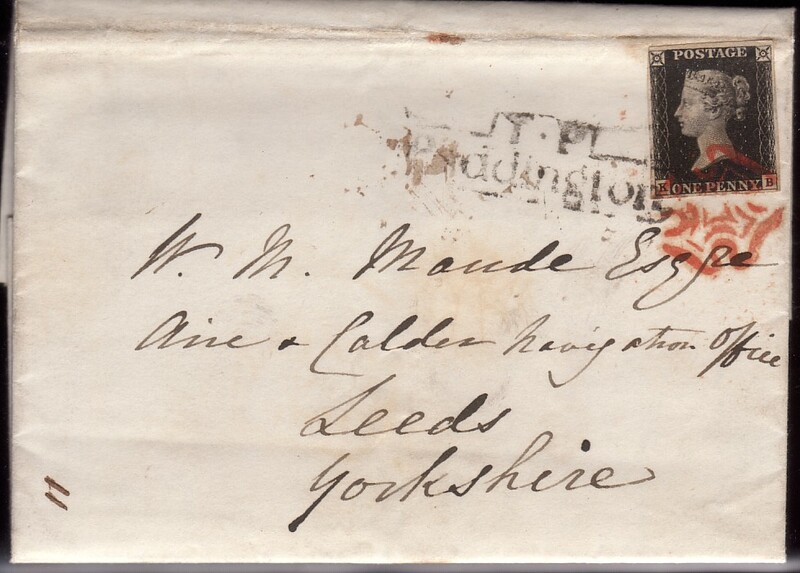 tied to an entire from York to Malton, York cds's on reverse top flap for August 26th 1840.
and there is a third strike clear/just touching the 1d black at the base. and this is the first we have been able to offer for a considerable time. very fine 4-margined example in this scarcer shade. 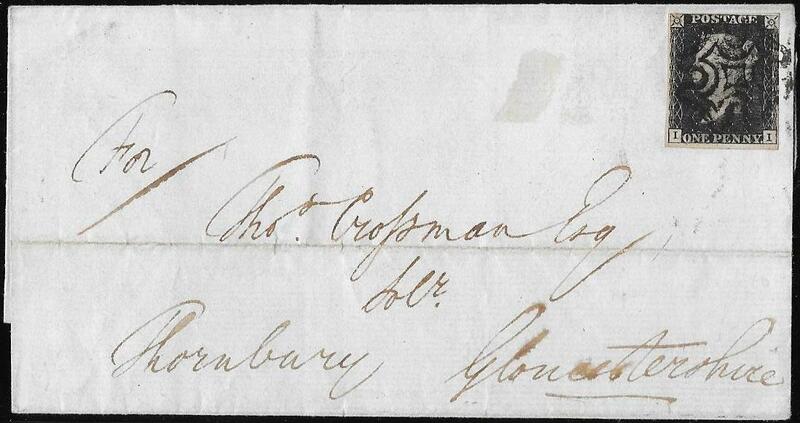 Neatly tied by a London cross on a clean entire to Petworth, February 6th 1841. Contrary to the Post Office Regulations at that time. Priced by Gibbons on cover at £775. with a couple of small tone/ink marks in the right margin area. 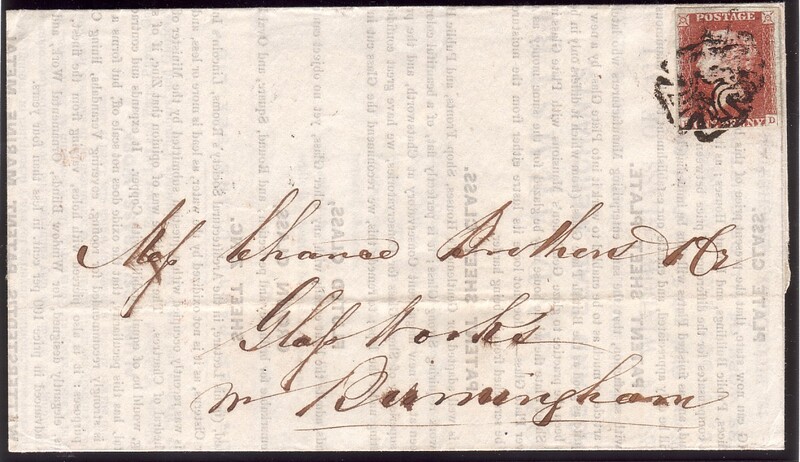 Used locally within London, on the reverse a date stamp for September 16th 1840. This is an early and fine example of the experimental use in London of black ink. The trial began in London on August 31st 1840. 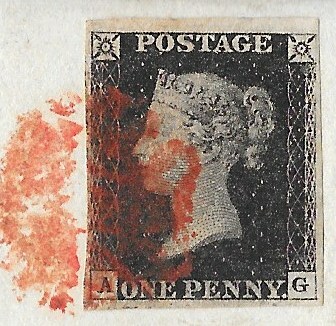 Stamp affixed at the top left Contrary to Post Office Regulations. 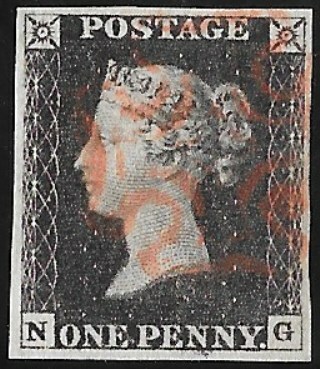 Wrapper in a finer condition than the scan suggests. 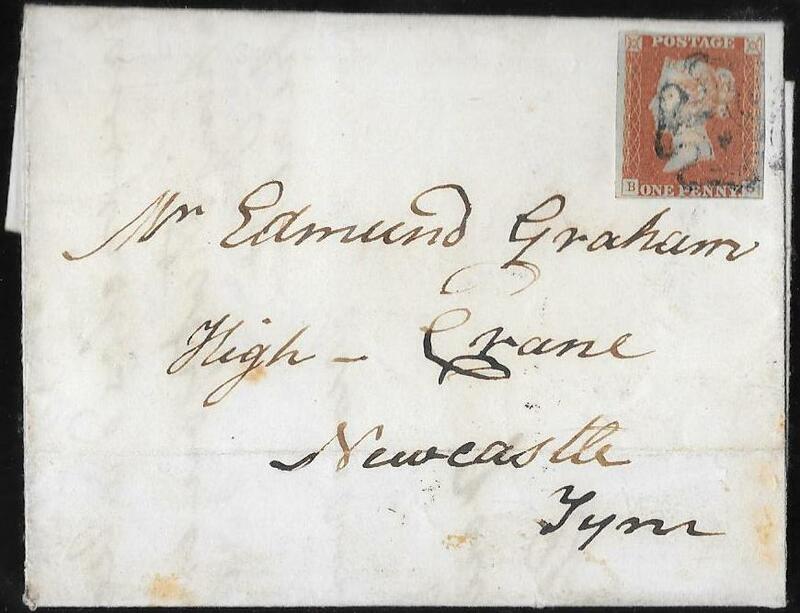 is also dated September 16th 1840, sent from Glasgow with a RED cross. 152178. 1d Plate 6, 'AG': fine 4-margined example, close at left but clear. The stamp is printed in the scarcer Intense Black shade, Spec AS40. Tied to a clean entire from Bristol to Chard by a parially smudged BRISTOL Vermilion Cross, SG Spec A2vh. 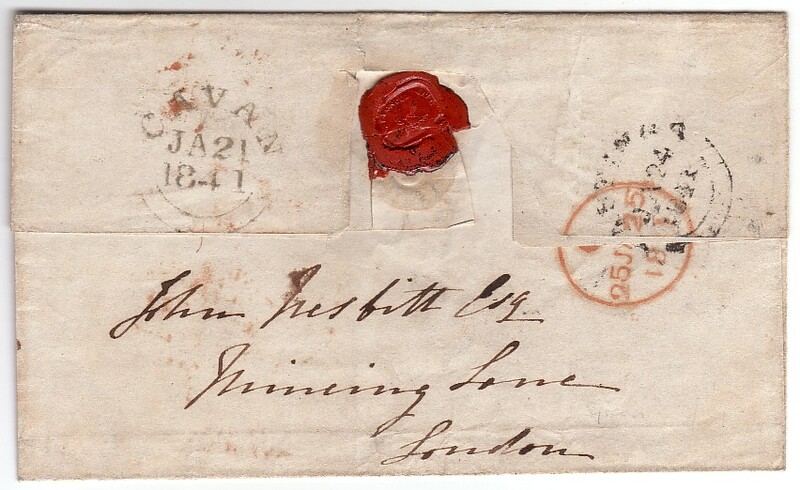 On the reverse is a fair strike of a Bristol date stamp, October 14th 1840, also in the same vermilion ink. Priced by Gibbons in the latest, 2011, Edition of QV Volume 1, at £3,000. 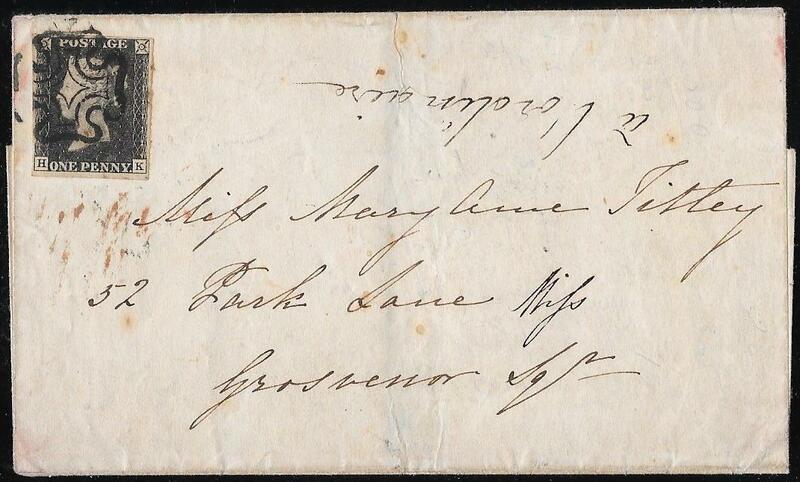 NB: The letter refers to a TRAIN ACCIDENT and the 'cargo of lace was saved and is now in the Cheltenham Station'. October 26th 1840 date stamps on reverse, by a fine red cross. ie Cheapside, a London Twopenny Post Receiving House. This plate priced by Gibbons on cover at £825. Plate 9 : Fine pair on entire. fine/very fine PAIR in this scarcer but unlisted shade from this plate. for January 11th 1841 in the same shade of ink as the crosses. which gives a figure of £5,000 on cover. we have been able to offer in such fine condition. 1d Black, 1d Red imperf and 1d Venetian red - last day valid for postage. tied to a clean and uncreased envelope, registered and used within London. 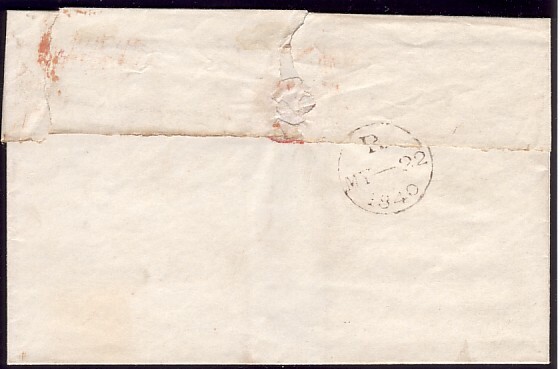 The condition is far cleaner than the scan suggests - the envelope is white. 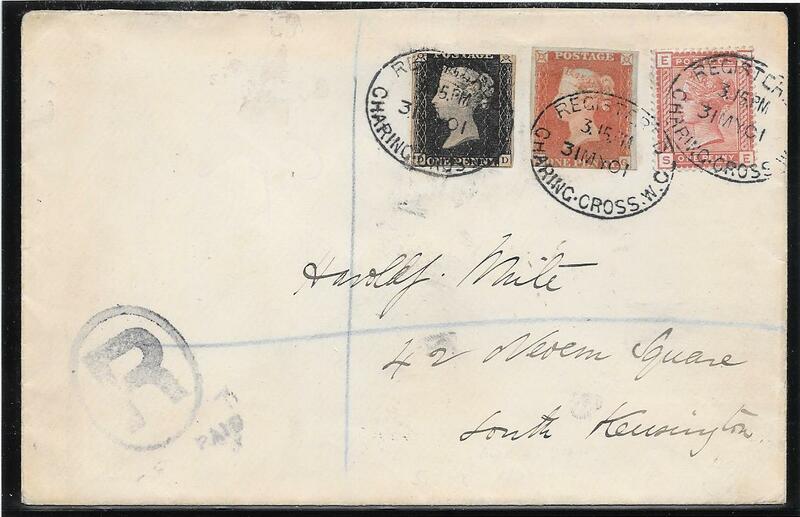 Each stamp neatly cancelled and tied by a very fine Charing Cross Registered oval date stamp for May 31st 1901. The 1d black is 3-margined, the 1d red full margined but very close to touching/clear at 'N' square: the 1d SG166 is fine. 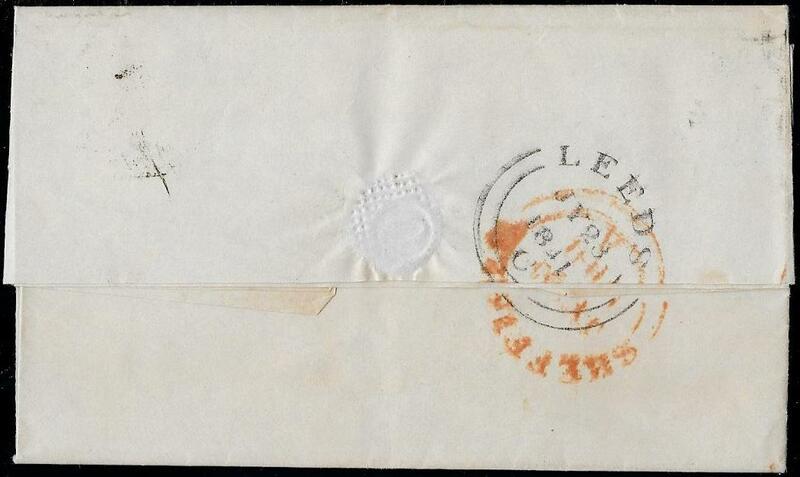 the 1d lilac remained valid for postage until July 1st 1915. 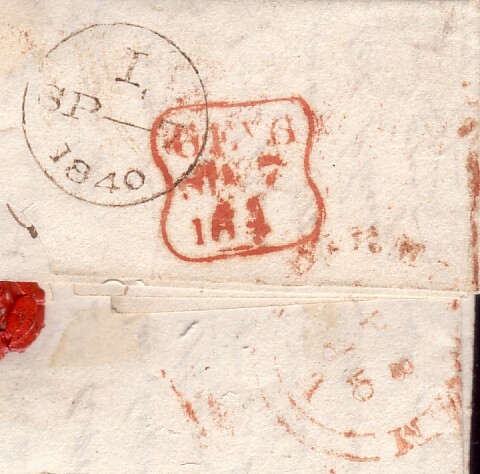 Hence these three stamps were used on the LAST DAY before becoming invalid for postage. They were also the only colours of the 1d value printed between 1840 and 1880 - in 1881 the 1d lilac replaced SG166. Very few late usage examples are known of the 1d black and especially on cover. 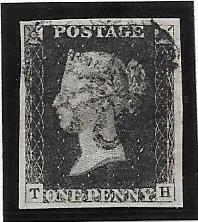 late use 1d black examples, with other than 1844 numeral cancellations, have appeared on the market. 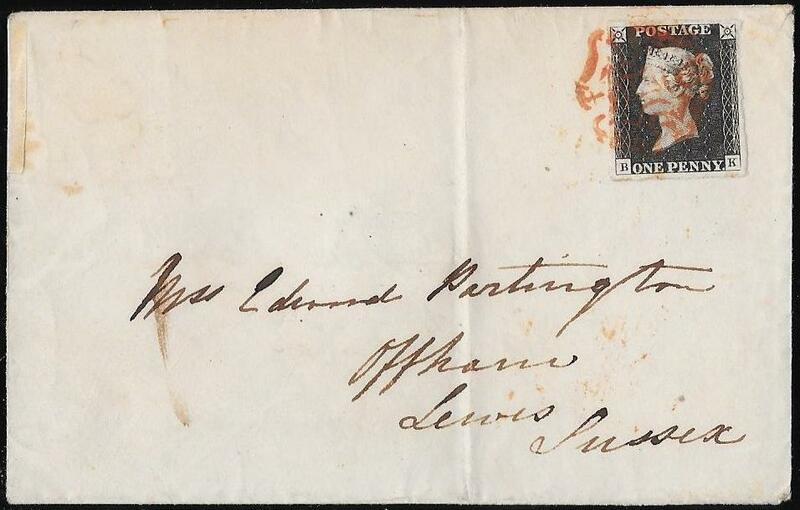 and Lot 263 plate 6, on small piece, tied by a London cds for November 18(?) 1902. This subsequently appeared in a Spinks Sale, April 2009 as Lot 290 and sold for an inclusive figure of approx £1,000. 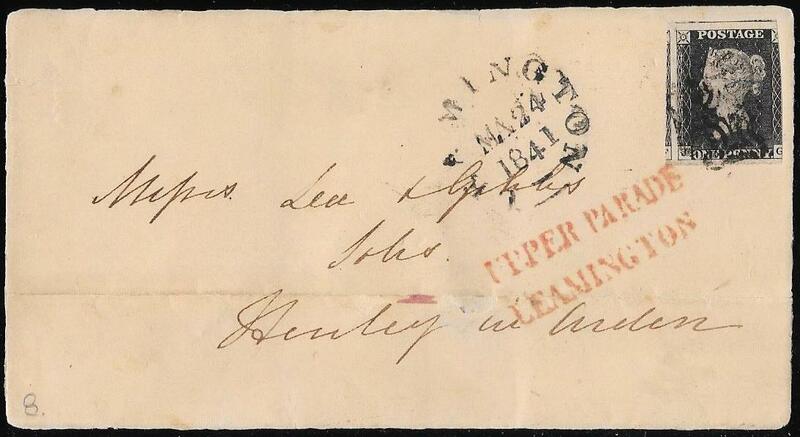 tied to envelope by a Bristol s/w duplex for March 29th 1857 which sold for £2,990 inclusive of the Buyers Premium. and the LATEST known usage on cover of a 1d Black. A remarkable and memorable item of Exhibition Importance. contained an example of a 1d black with a late usage on cover. Sample of Engine Turning: similar to that used on the 1d Black and Mulready. 1d Plate 7: Orange Cross of Liverpool. 151408. 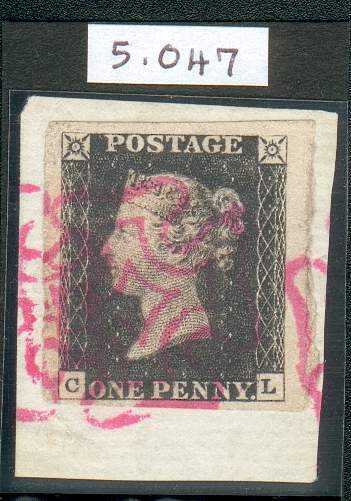 1d black, SG2, Plate 7, 'OC': superb 4-margined example with part of stamp above in top margin. 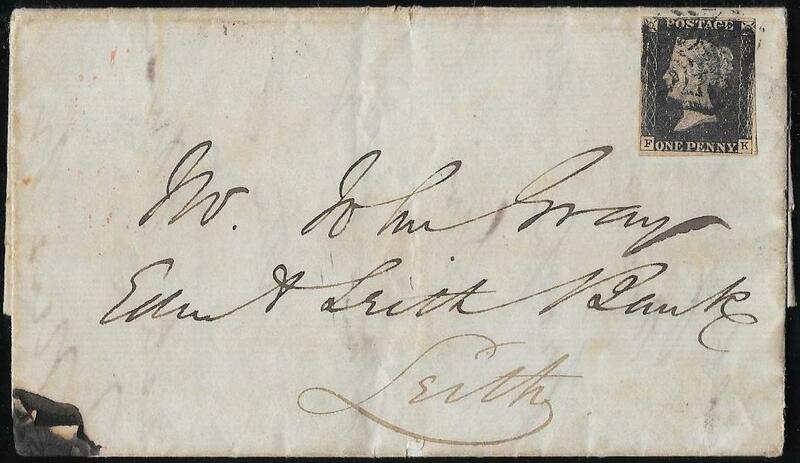 Tied to a very clean personal letter from son to his mother in Greenock from Liverpool, August 31st 1840. The MX is the orange cross of Liverpool, SG Spec A1vg, with a Liverpool cds on the top flap in the same orange ink. The top flap when raised show the cds to advantage and the MX leaves a clear QV profile. on the cheapest 1d plate but £2,850 on the scarcer Plate 7. Attractive and very scarce item so fine. 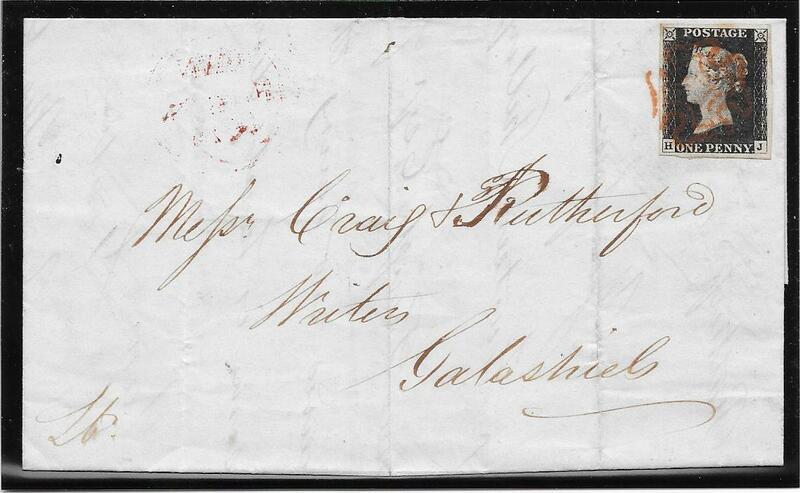 Tied to a wrapper from Edinburgh to Gagashiels by an orange cross which leaves QV's profile virtually clear. 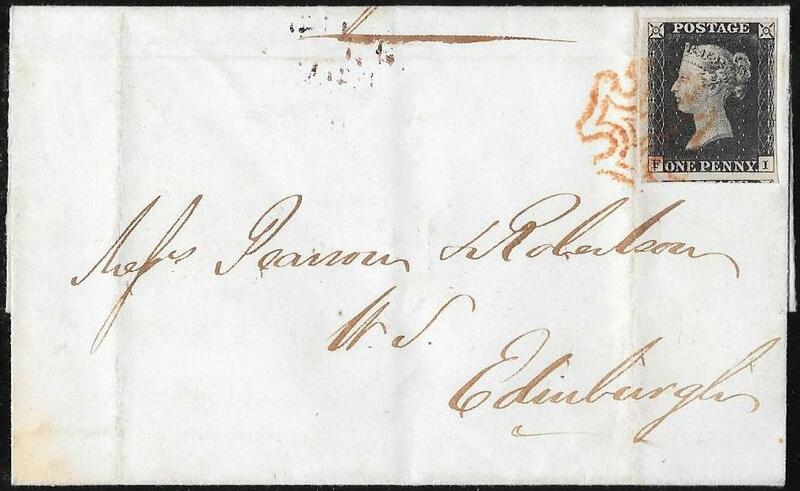 Ediburgh cds on reverse top flap for January 6th 1841. 151336. 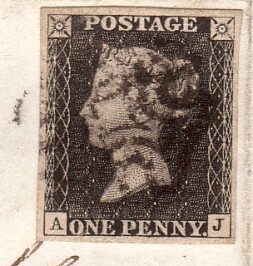 1d black fine plate 3 'DE', full margins with a trace of the adjacent stamp at left, close but clear at the right. Printed in the Intense Black shade from the early printings. 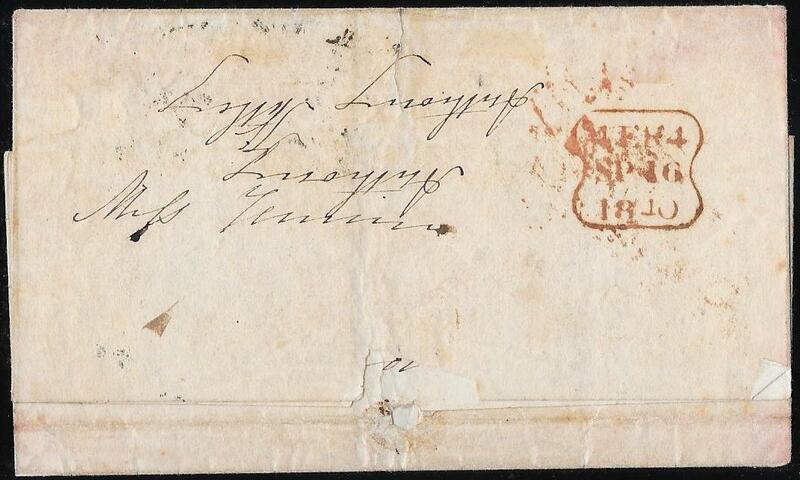 by a lightly applied deep red MX in the same shade of ink asthe Newport-Mons cds on the reverse for July 28th 1840. 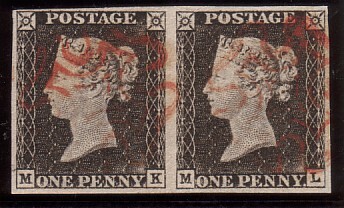 The MX leaves QV with a clear profile and the 1d black affixed, Contrary to PO Regulations, at the top left. 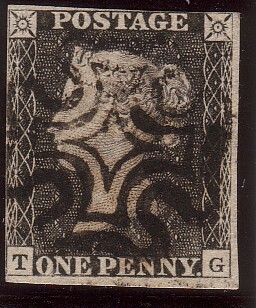 An attractive and scarce WELSH usage of the 1d black with Plate 3 in this shade priced by Gibbons in excess of £1,000. 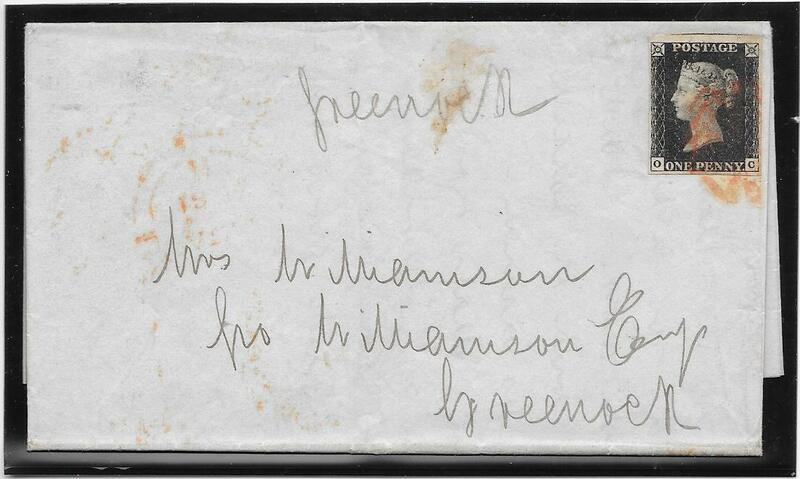 NB: the scan suggests browning at the top of the image but this is barely visible. each corner clipped as occasionally one sees on the 1d black but rarely on cover. 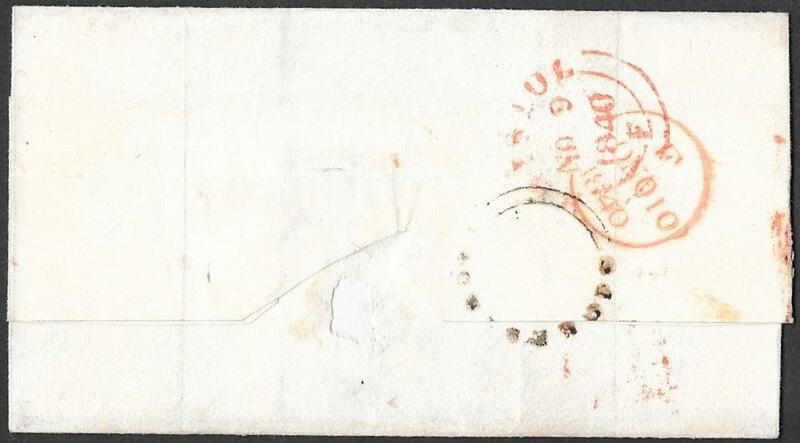 The sender clearly wanted to add an 'artistic note' to the stamp, or to the label as they were originally known! Printed in the scarcer Intense Black and tied by a double strike of the first type of Norwich cross contrary to PO regulations. In fact there is a small trace of a third cross. There appears to be a black oval to the left of QV's crown - this is the gap between the MX's and not an ink mark. Scans anomolously suggests a red ink marking 'Sep 28/40' at the top - there are indistinct faint red marks in the area but hardly visible! Plate 2 in this shade priced by Gibbons in excess of £1,000 on cover. An attractive item with an unusual number of features. 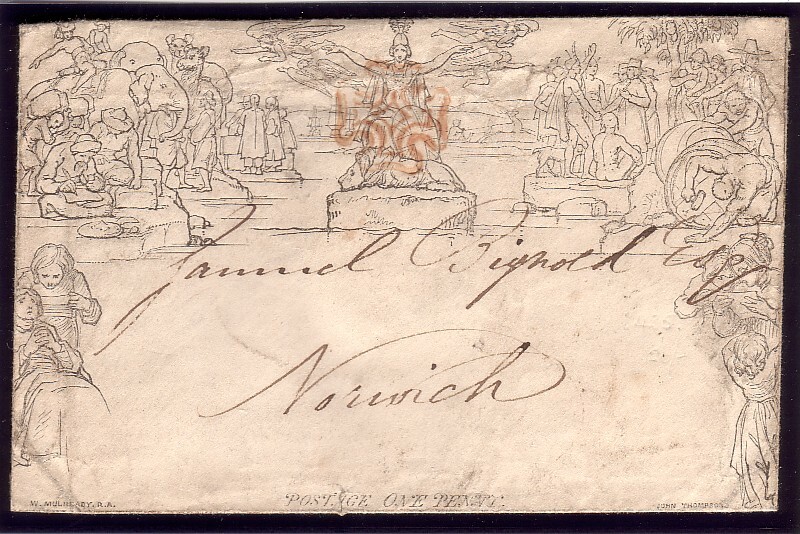 on a clean wrapper, side flaps removed for display purposes, used locally in London November 28th 1840. 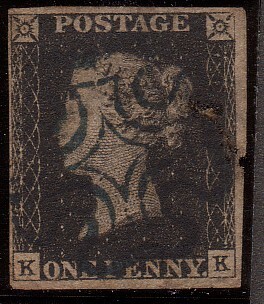 The stamp is tied by two BLACK crosses Contrary to Regulations. This is an experimental use of black ink as the usual ink at that time was red. Very scarce especially with the double strike of the black cross. Gibbons prices at approx £1,200 on cover in this scarcer shade of ink. November 24th 1840, by a neatly applied orange cross. The cross leaves the Queen’s profile and the head almost totally clear. 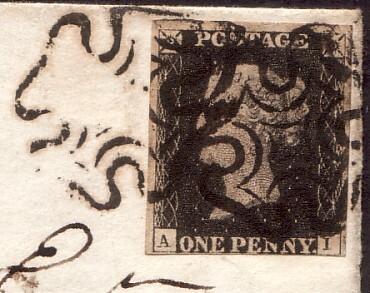 large and with a small part of the adjacent stamp at the right margin. Stamp printed in the scarcer intense black shade. PAID AT CAVAN with 1d black plate 1b. 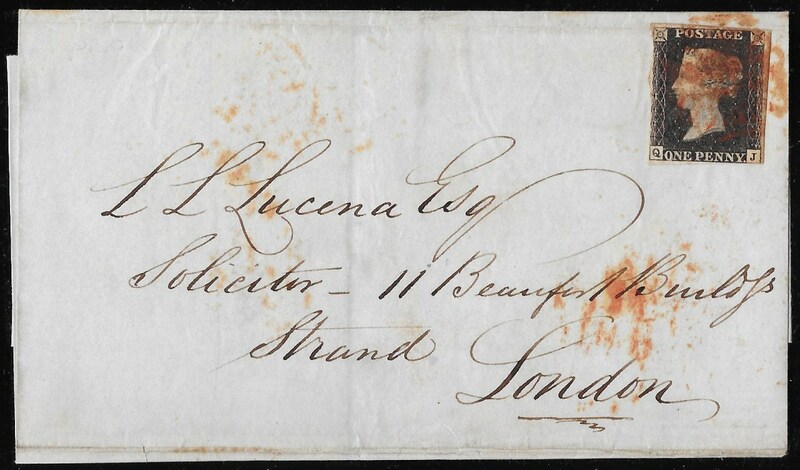 and the letter re-addressed to Mincing Lane, London and received on January 25th 1841. 1d black plate 3: MARYPORT Crosses in RED. with the 1d black tied by two fine strikes of the Maryport cross. 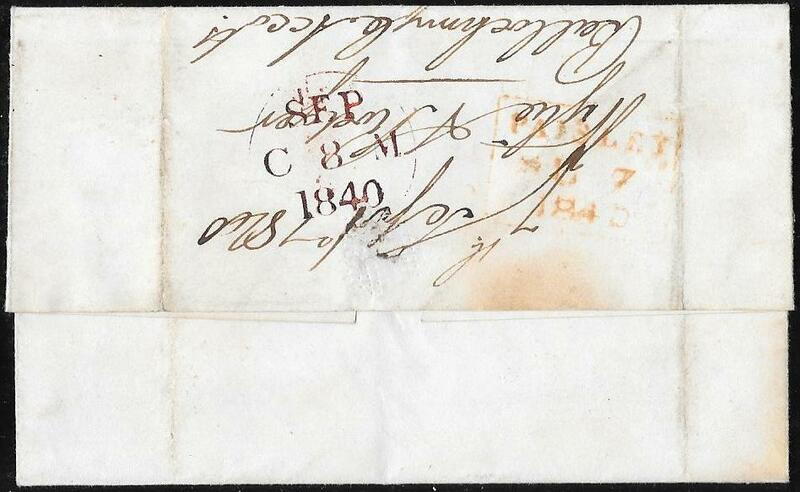 On the top flap is a fine Maryport cds for February 11th 1841, with inverted 1's. was using up the red ink, hence the double strike, before using black ink. the population of Maryport in 1841 was only 5,311. The earliest usage of this cross that they record is June 13th 1842 and the only one with a 1d black is for June 17th 1842. Hence the example offered here predates both these. 1d black plate 3 on cover priced by SG at £900. 1d black PLATE 10: RAMSGATE cross. son to mother and sister, from RAMSGATE to Newbury, Berks, March 24th 1841. The Ramsgate cross is recorded by Rockoff, Volume 2, page 232. Only three examples are illustrated, none on a 1d black. the finest we have been able to offer. 1d black plate 10 on cover priced by Gibbons at £3,500. Mixed plates: 8 and 6 from Belfast to Armagh. The EKD usage of Plate 8 is September 5th 1840 and this item used on September 29th 1840. 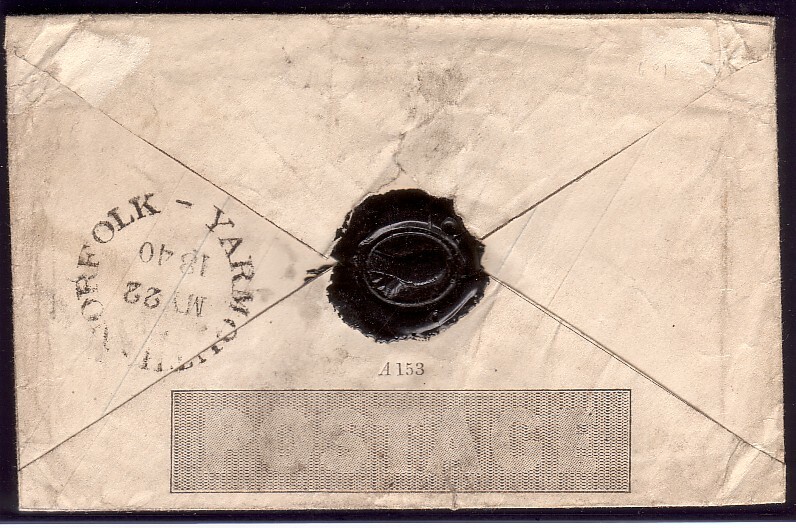 It is believed to be the earliest known mixed plate franking with plate 8 in Ireland. 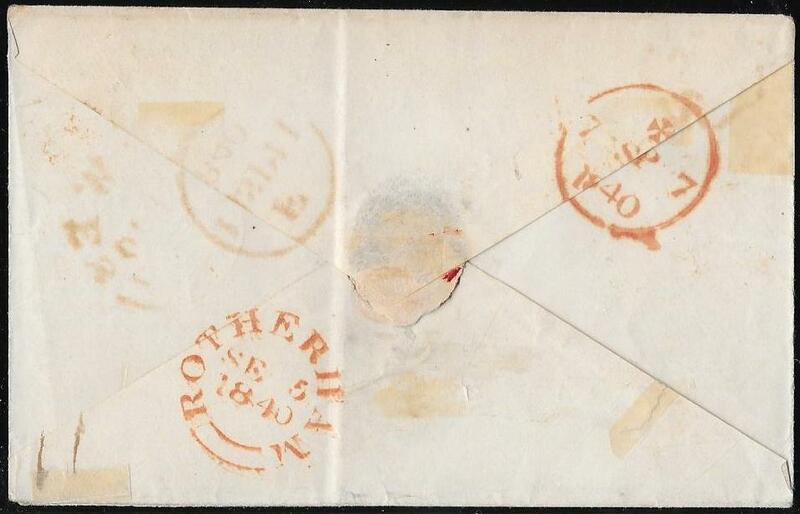 A very rare MIXED PLATE franking and an Irish rarity. London to the Aire and Calder Navigation Office in LEEDS, September 2nd 1840.
and tied by a red-orange cross leaving almost the entire of QV’s head clear. It is also tied by a 'TP Paddington' in black. A Quartet of Items May 22nd 1840. 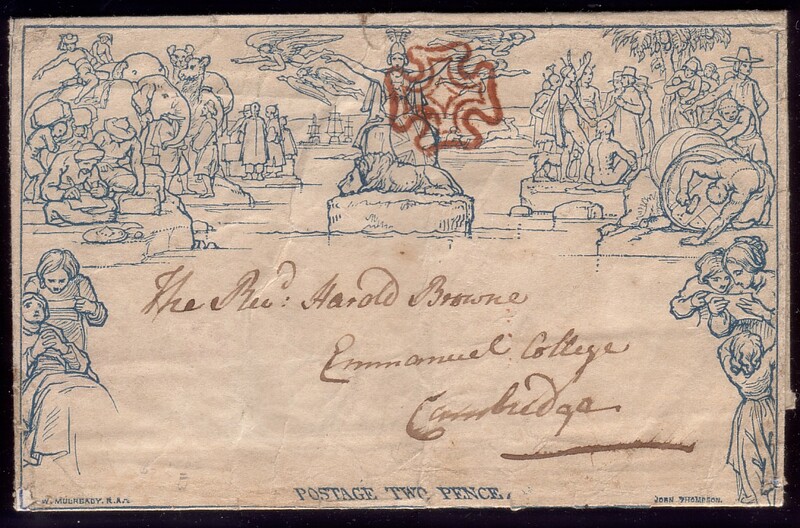 Neither the 2d Mulready nor the 2d Blue wrapper are recorded in Jackson’s book of May 1840 usages. A truly remarkable and unique grouping. Price: £6,775. very fine 4-margined on neat entire London to Edgbaston and tied by a superb London cross in EXPERIMENTAL BLACK ink. 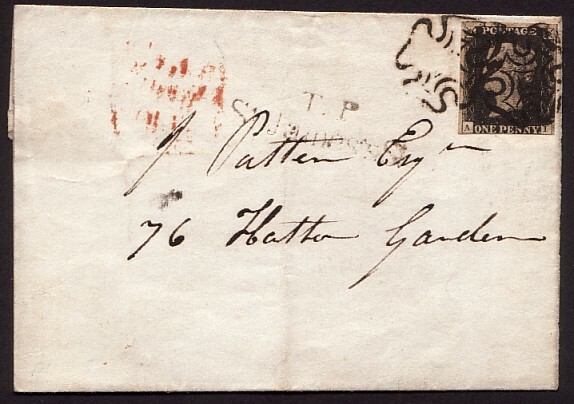 Top flap raises to display the London date stamp, September 7th 1840.
hence this example a very early usage in this experimental period. and this example is believed to be the EARLIEST KNOWN USAGE of a black cross on plate 2. 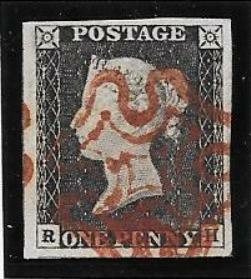 Stamp printed in a shade close to, or in, the scarcer intense black, Spec AS14, of the earlier printings. 4-margined example, tied to small piece by a lightly struck red cross. This allows the considerable plate wear to be seen to advantage. and a result of the plate not having been hardened. Plate 1a: superb pair with RPS cert. MK has the catalogued variety 'mark on left margin at top of M square', Spec A52e. 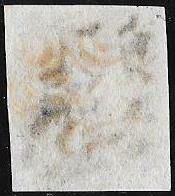 Natural minute paper inclusion in 'MK'. Lightly applied red crosses allowing the moderate plate wear to be clearly visible. Gibbons prices a pair in this plate at £1,800. Supplied with a 2001 RPS Certificate. cancelled by a MX in an unusual shade of ink. but listed for Plate 1b. fine 4-margined example, red cross. with huge margins on three sides, cancelled by an orange cross. Printed in a shade close to or at the listed Intense Black. There is a vertical watermark guide line on the reverse. Exceptional stamp and very attractive. Plate 1b: tied to piece. 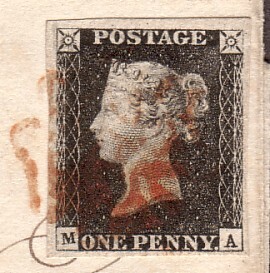 very fine 4-margined example, part of adjacent stamp in the top margin. Tied to piece by a complete MX in a shade close to, or at, vermilion. Attractive and scarce so fine. 1d Plate 1b: 'Magenta' cross. tied to a small piece by forged magenta Maltese crosses. With a 1995 PEGB Cert. 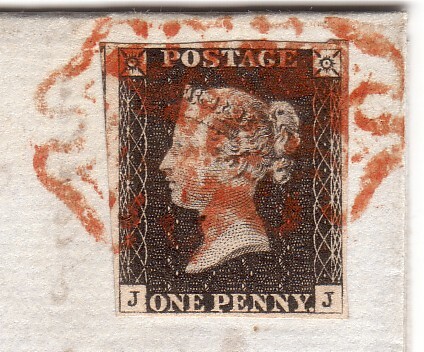 An unusual and attractive stamp. NB: very surprising to see a forged cross on such a superb 1d black. 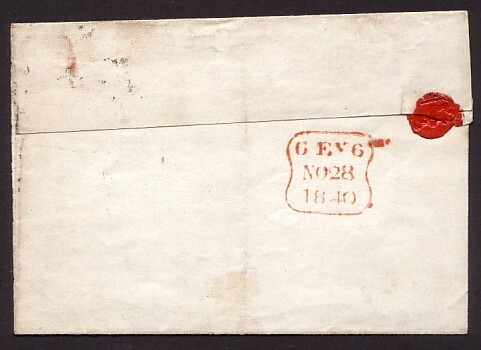 on THIN PAPER and with INVERTED Watermark, SG Spec AS4(l,m). large margins on three sides but touching at places along the bottom margin. 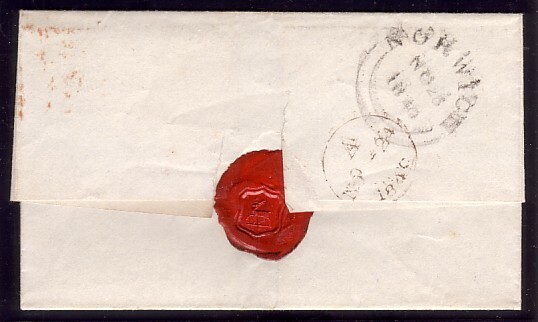 Cancelled by lightly struck red cross and with INVERTED watermark. Priced by Gibbons at £2,500. at a small percentage of the Gibbons price. very fine/fine example with a superb and neatly applied red cross. 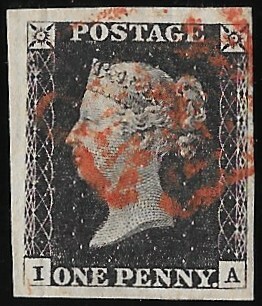 An attractive example and very scarce with a complete cross. printed in the scarcer Intense Shade Spec AS14, priced by Gibbons at £525. Superb margins with part of the stamp above in the top margin. A black cross is scarce on this plate and priced by Gibbons at £650 without the premium for the shade. 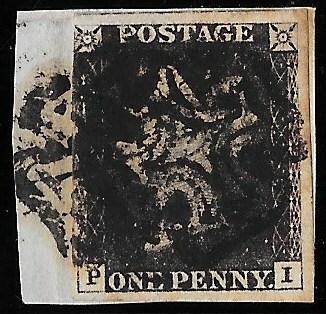 The cross leaves a clear profile and is clear of the plate corrosion around 'One Penny'. Vertical guide line in the SE letter square. 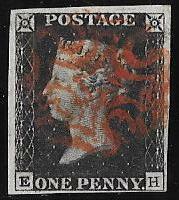 A superb stamp with a rare combination of features and a Gibbons price in excess of £1,000. 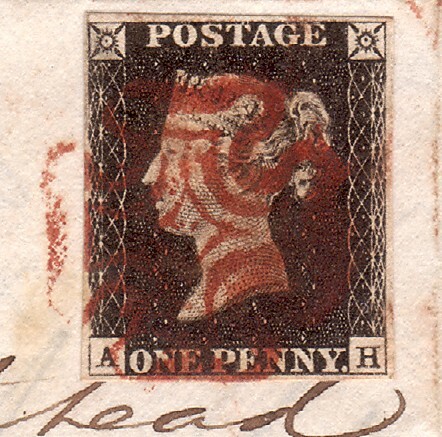 fine 4-margined example, slightly ragged margin near 'L' square with part of the stamp below. Plate 2: MANCHESTER Fishtail Cross. Plate 2 is much scarcer with a black cross, specAS15m: almost TWICE the Gibbons price. 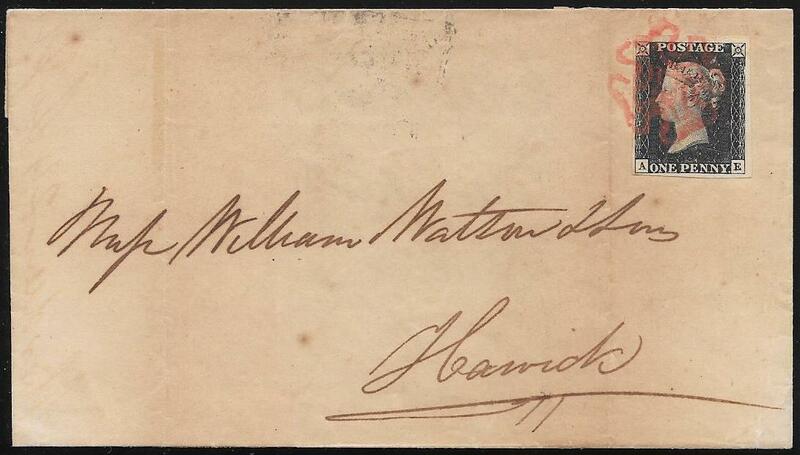 Manchester cds on reverse for March 6th 1841.
the earliest known is March 3rd 1841 on a 1d black plate 8. Spec AS15ub, and priced by Gibbons at £4,500 without the Plate 2 premium. A very rare item with likely a unique combination of features. very fine large 4-margined in scarcer intense black shade, spec AS14. at the right and with a horizontal guide line in the NE square. The neatly applied cross leaves QV's profile visible. A rare and attractive stamp. 152195. 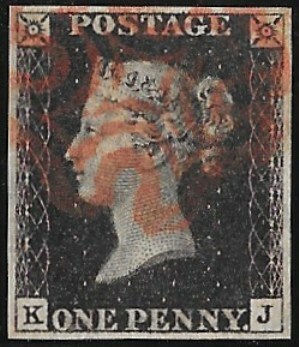 1d plate 2, 'JA', very fine, four square - margined example, small paper inclusion away from the Queen's head at right. Printed in a shade of ink close to or at the scarcer intense black. 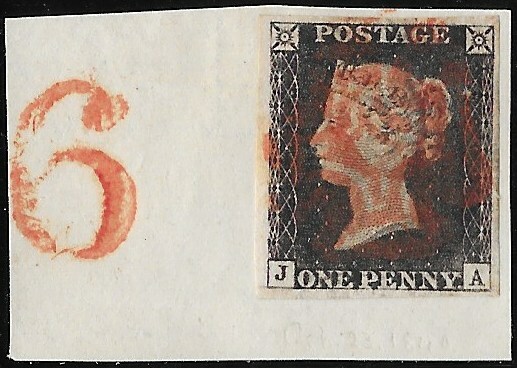 Although not tied to the piece, it clearly belongs with the orange cross in the same shade of ink as the hand struck '6'. and the variety 'no Ray Flaw' Spec AS15f. 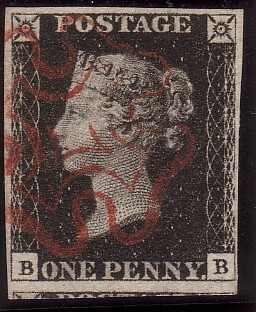 An attractive stamp and rare with a combination of these varieties. 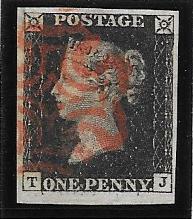 superb large square 4-margined example with almost a complete orange MX. The letter 'P' shows the listed variety Spec AS20a, 'Letter P with small loop'. Printed on un-listed THIN PAPER and showing plate wear. 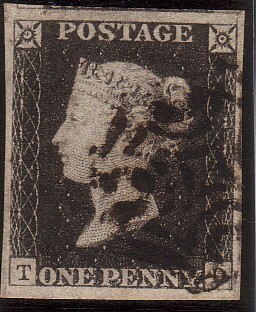 A very attractive and rare stamp with a number of features. very fine/fine 4-margined example with red MX. 151432. 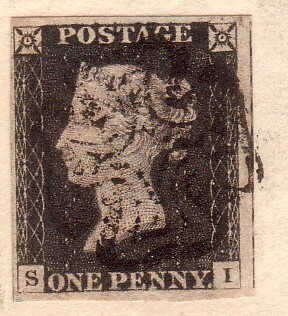 1840 1d black plate 4 (SI). 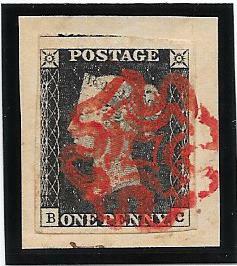 Very fine used, scarce intense shade with a red cross. The stamp has been printed on Unlisted THIN PAPER. 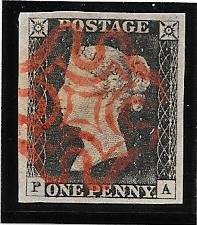 very fine, square margined example, lightly applied orange cross. An attractive stamp and printed in the scarcer Intense Black ink, Spec AS22. 151442. 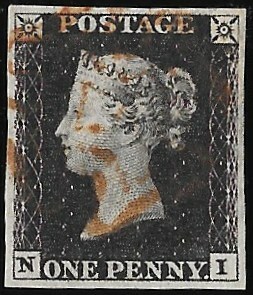 1d black Plate 4, 'NJ', very fine 4-margined example. 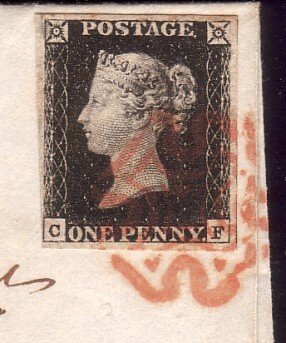 Margin close but clear at 'N' square with small part of adjacent stamp in right margin. Tied to small piece by a fine example of a double-lined cross. 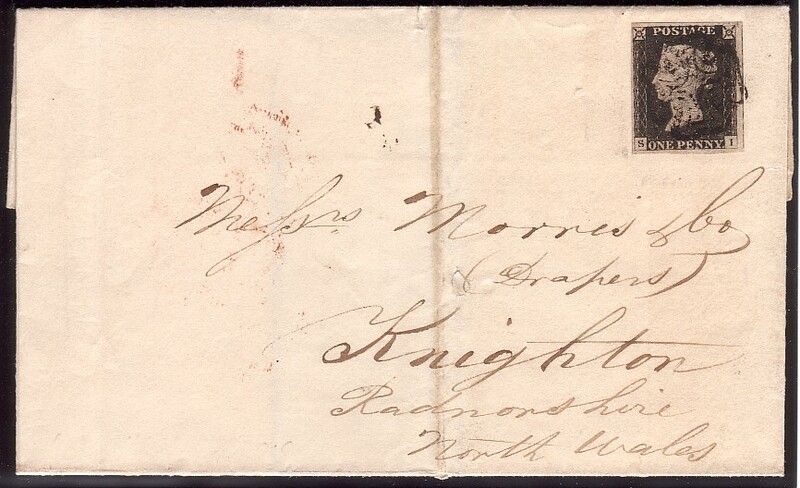 Very scarce variety of the MX. Unusual to find a double strike of this cross but see the next item. Contrary to PO Regulations, cancelled by a double strike of this cross. 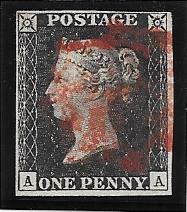 The1d red is on a printed advertising wrapper with a partial double strike of this same cross, Spec A2ub. in the latest Edition, 2011, QV Volume 1. 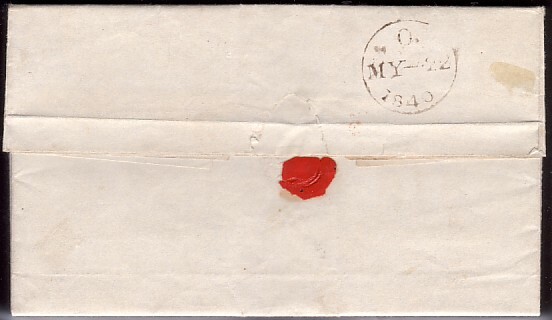 Manchester date stamp in red on the reverse of each for March 26th 1841. A unique same-day of usage pairing which whould make a fine display page. a partially struck orange-red MX. and printed on unlisted Thin Paper. which is more extensive than we have previously seen on any 1d black plate. Rare stamp with these features and condition. Plate 6 with BLUE MX and Cert. SG Spec AS41vc and with Certificate. 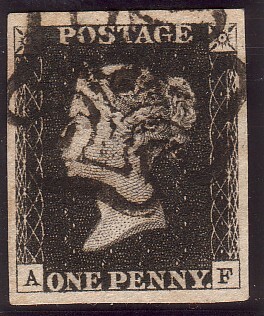 A very rare stamp despite the faults and priced by Gibbons at £12,000. Seldom offered especially with Certificate. and offered at a fraction of the Gibbons price. printed in the scarcer Intense Black shade. and the MX leaves all the re-entry marks clearly visible. This exact variety is illustrated by Gibbons in the latest, 2011, Edition of QV Volume 1, page 65. There are only four listed re-entries on this plate: ie four per sheet of 240! 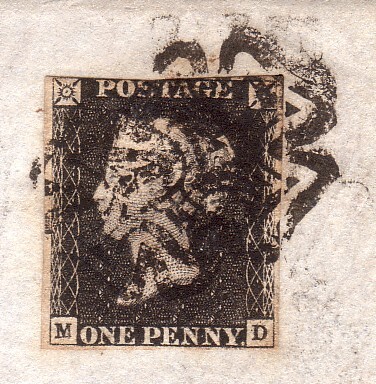 The stamp is printed on THIN PAPER: this variety is unlisted as yet by Gibbons. 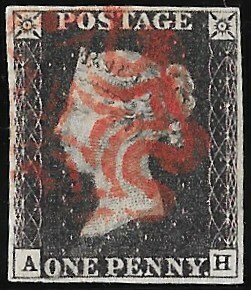 An exceptional and rare stamp with this combination of features. 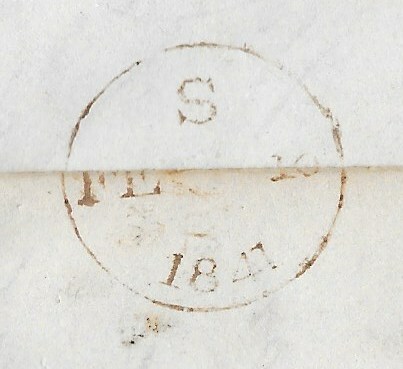 large part of another stamp in bottom margin. Very fine red cross lightly applied. with a light orange cross. Printed on UNLISTED thin paper. 151434. 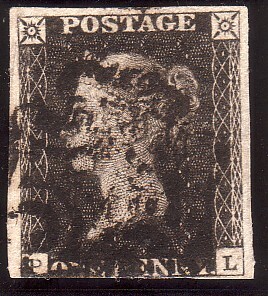 1840 1d black plate 6 (AF). 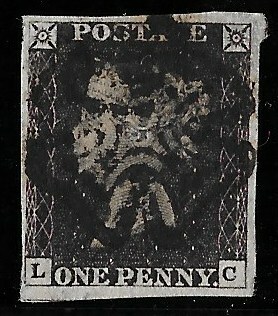 Very fine large square margined example with black cross. Plate wear at the top. 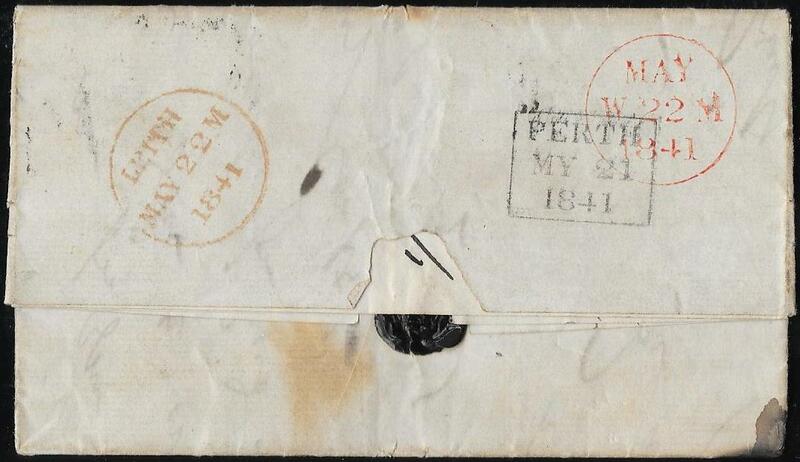 Penny Post and MX Cancellations on Plate 7. 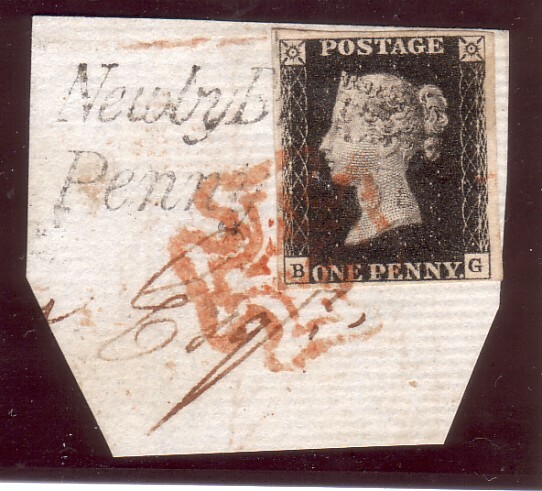 AND the rare Newby Bridge Penny Post, CC LA690, lightly struck in black. Newby Bridge Penny Post came under MILNTHORPE and the red cross would have been applied there. on 1d blacks are more frequently seen with a black MX: the red MX here leaves QV’s head largely clear. SGSpec AS44ya, from £3,000 on piece. Plate 7: Orange cross of LIVERPOOL. 151441. 1d Black Plate 7: Liverpool Orange Cross on Entire. 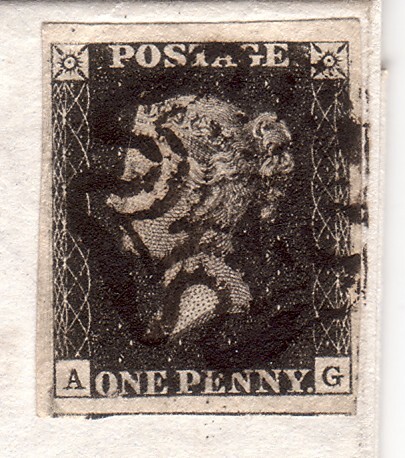 Very fine 4-margined copy from Plate 7 with portions of THREE other stamps in the margins. 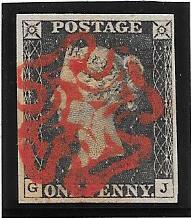 Tied to entire to Ballymoney by the orange maltese cross of Liverpool, Spec A1vg. 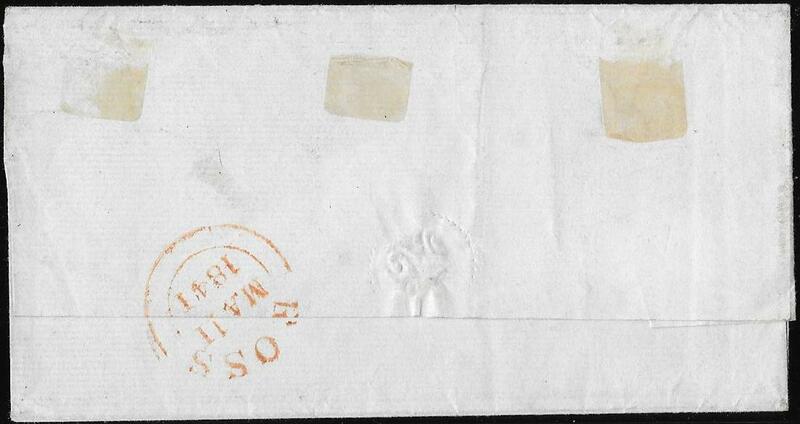 On the reverse is a Liverpool date stamp in the same orange shade as the cross for August 15 1840. 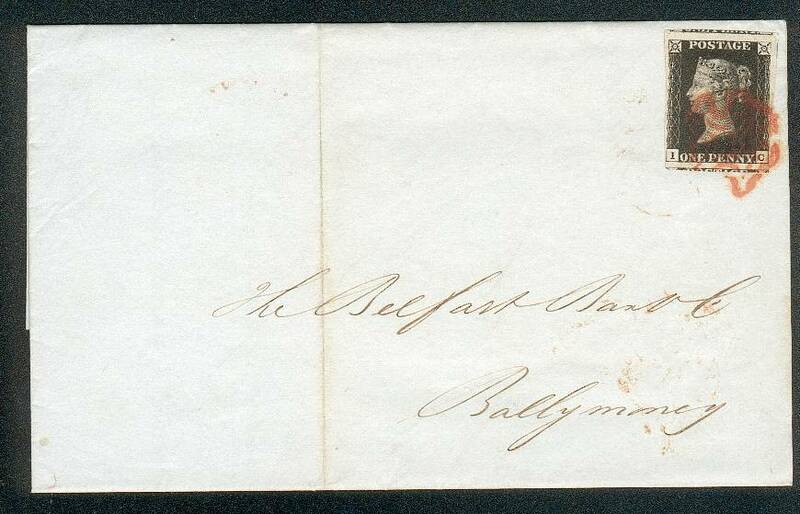 Also on reverse a Dublin date stamp for SUNDAY August 16 1840. Gibbons prices this orange cross at £2,600. printed on Experimental thin paper, SG Spec AS44c. Cancelled by a red-orange cross. 152193. 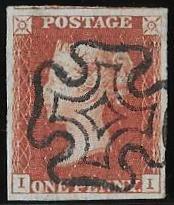 1d plate 7, 'KF', very fine used, orange cross. Printed on 'Experimental thin paper', SG Spec AS44c. bottom margin and part of another bottom right side. Very scarce/rare stamp so fine. Printed on 'Thin paper', SG Spec AS46e. 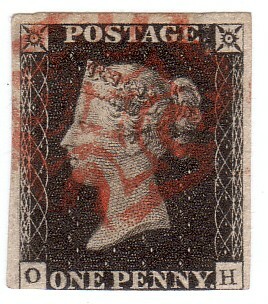 Attractive stamp with the 'O' flaw visible. 151512. 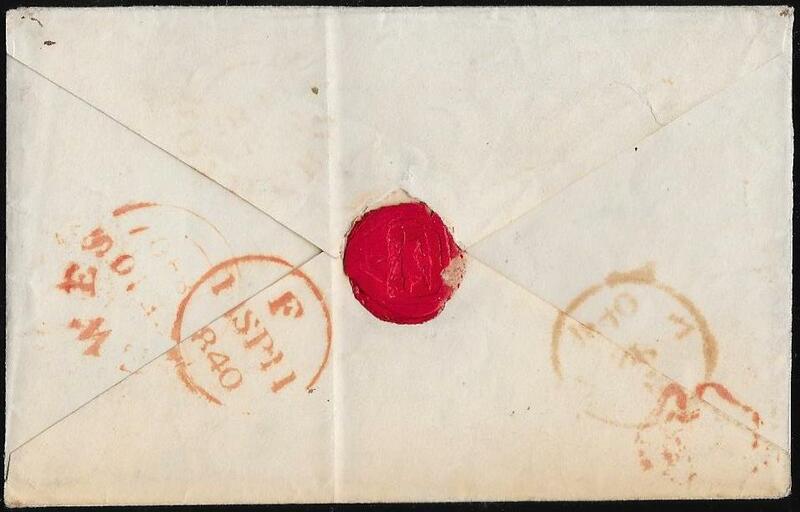 1d black Plate 8, 'TJ', light red cross: very fine 4-margined example. and is illustrated in the QV Volume 1 page 68.
along the bottom margin as well as in the corner stars. The printing is in a deep shade although Gibbons does not list it. The stamp is also printed on thin paper, Spec AS46e. bottom margin showing the re-entry so clearly. The re-entry is grossly under-priced by Gibbons at £575. 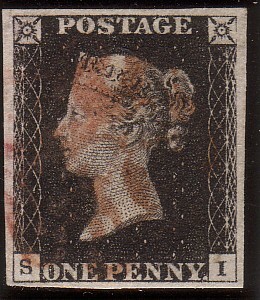 A very rare stamp in this condition with multiple varieties and features. 151435. 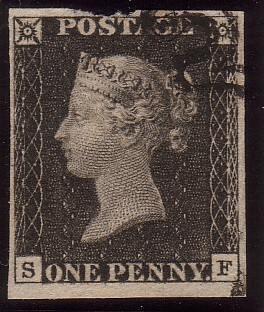 1840 1d black plate 8 (SF). but good to large margins elsewhere. Queen’s head virtually completely clear and rare thus. 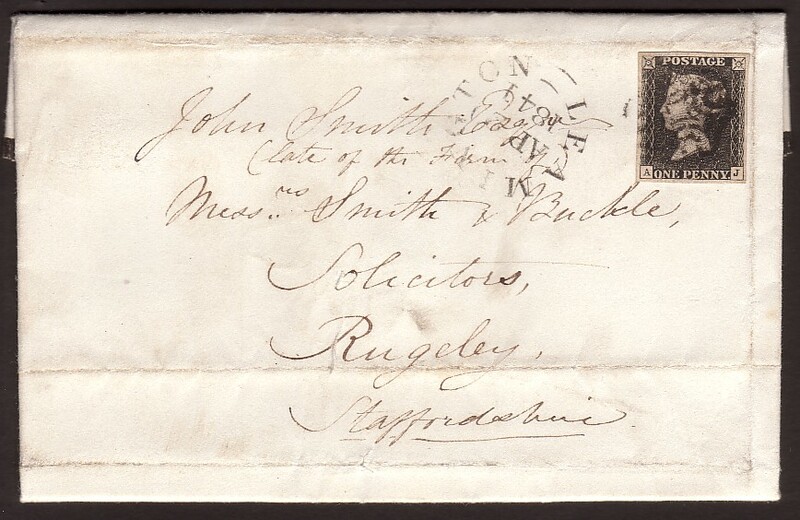 Leamington to Rugeley by a very fine Leamington characteristic cross, April 20 1841.
have similar catalogue prices and the Perth cross is priced at £9,000 on a 1d black on cover. Leamington can reasonably be expected to have a similar Gibbons price. Plate 8: BROWN cross with RPS cert. 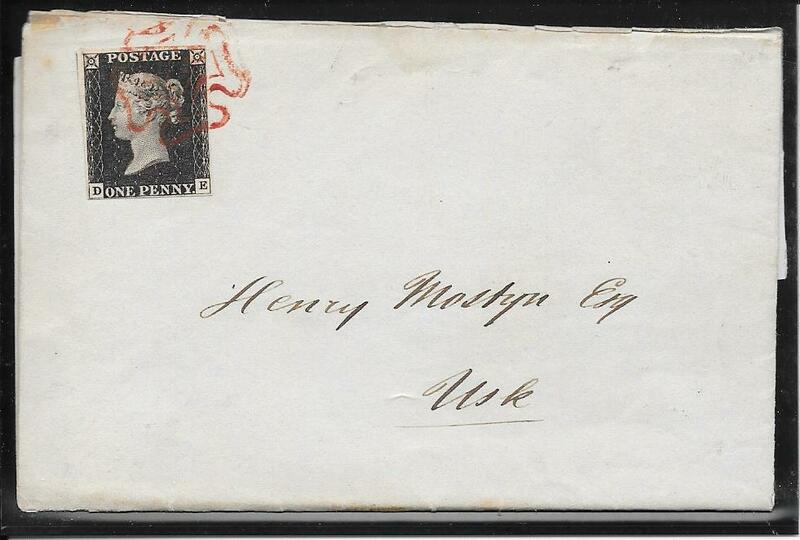 this rare cross is priced at £3,000 on a 1d black off cover and in our view is significantly undervalued. 1d black plate 8 compared to the cheapest black plate. This gives a figure in excess of £4,000. This is the first true BROWN cross we have been able to offer for a considerable time. It is for sale with a clear RPS Certificate. on thin paper variety, Spec AS56f. Very scarce/rare combination of features. 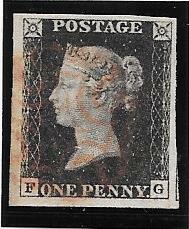 Priced by Gibbons at £730 with this paper variety. Plate 10: rare RED cross. and priced by Gibbons, Spec AS66h, at £1,500. and printed on thin paper: Spec AS66i. Allowing for the varieties, Gibbons price is approx £2,000. A very rare example with possibly a unique combination of varieties. but clear to very close to possibly touching at left. Very fine, upright and almost complete black cross. printed in the scarcer grey-black shade showing plate wear. Priced by Gibbons at a minimum of £950. 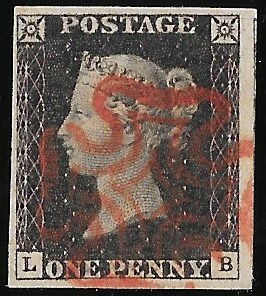 fine 3+ margined example ‘PL’, large margins on three sides and in to part way along the bottom margin. characteristic of this rarest of plates and catalogued at £4,500. A very collectable example of this rarity.